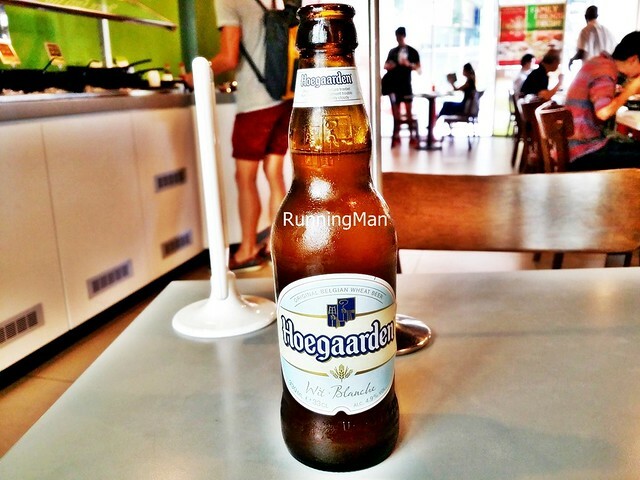 They sell beer here, such as this Beer Hoegaarden (SGD $11.95), in bottles or in buckets. 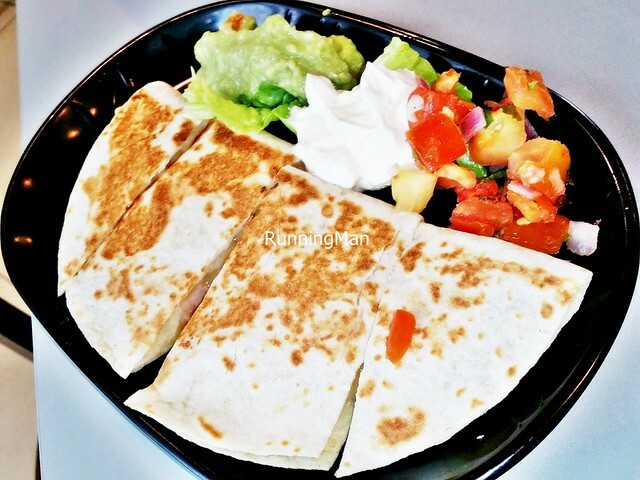 For the Burrito Set Meal (SGD $16.95), I chose to have the Burrito Mexicano With Steak. 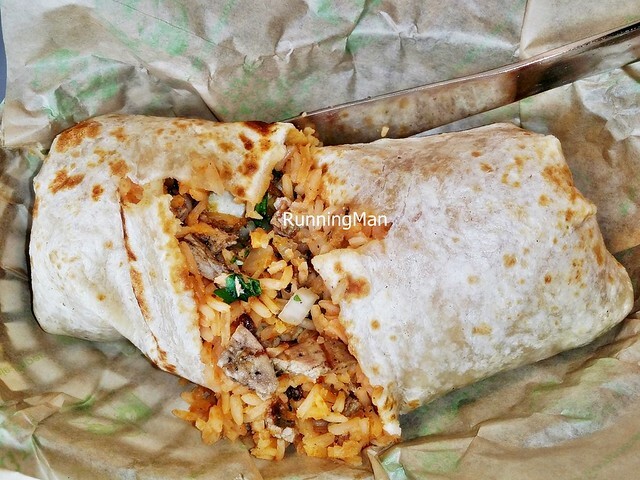 Features a huge burrito, almost like a small pillow, with a warm, soft, flour tortilla, stuffed with Mexican rice, pinto beans, hot tomato salsa, crunchy onions, cilantro, and chunks of beef steak. Very filling, the combination of freshness, crunchy texture, fluffy rice, and savoury meat is delightful. Only drawback is, I felt the steak was too dry and chewy in texture for my liking. 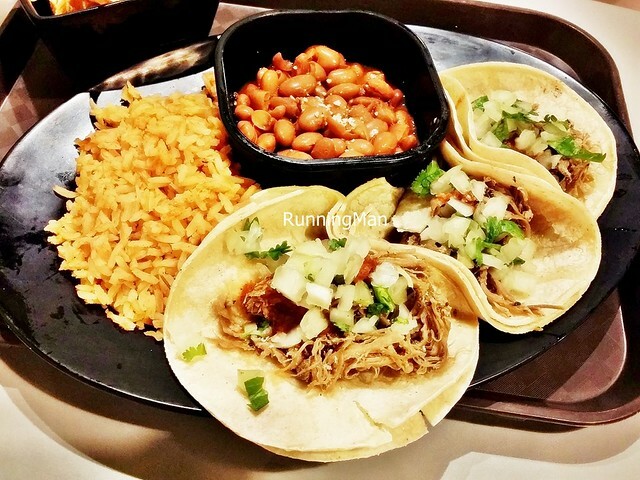 For the Taco Set Meal (SGD $18.95), I chose to have the Taco Original Baja With Pork Carnitas. 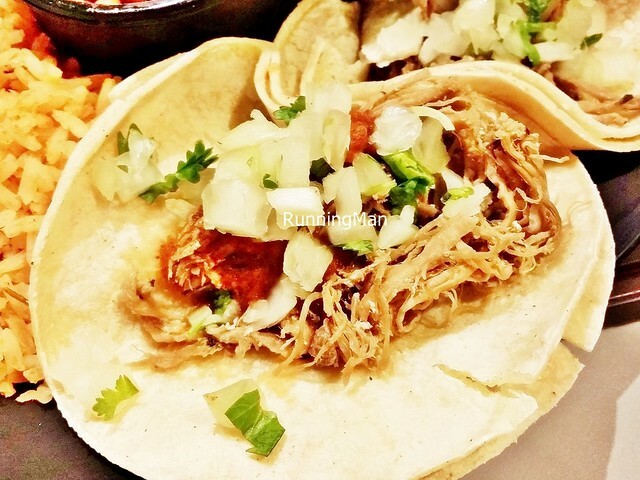 Features a trio of warm, soft, grilled corn tortillas, filled with hot tomato salsa, crunchy onions, cilantro, and shreds of pork carnitas. 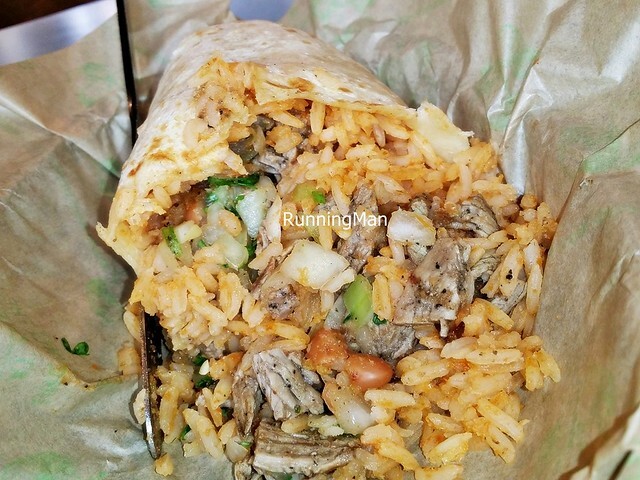 Served with Mexican rice and black beans on the side, this dish was very filling, best eaten together, as the combination of savoury meat and fluffy rice is yummy. The pork is nicely tender and savoury, though it can be dry if eaten on its own. 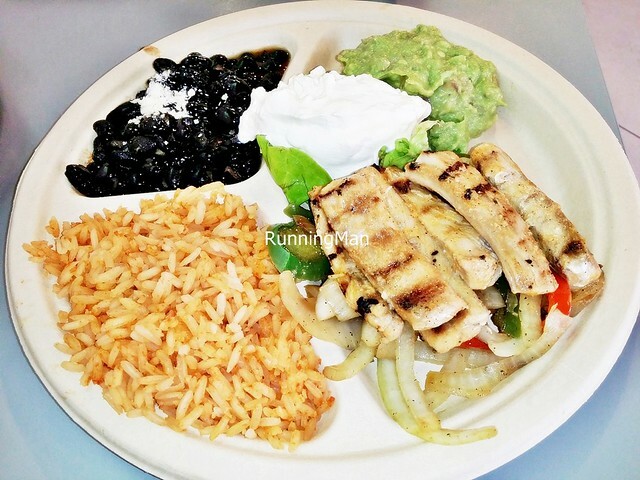 Each meal is served with Black Beans / Pinto Beans, and Mexican Rice. 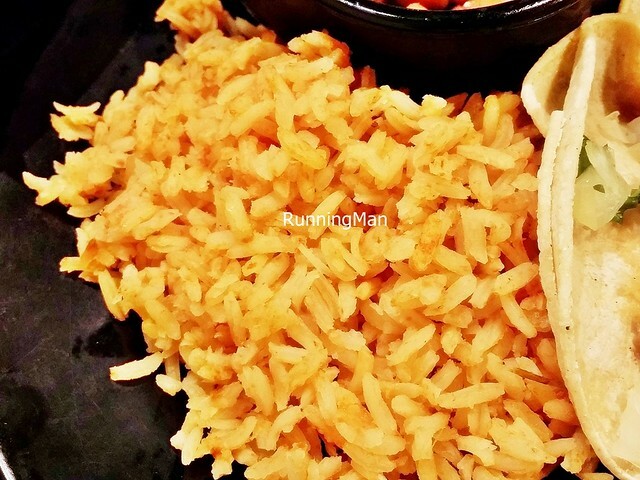 Love the soft, fluffy texture of the rice, and the nice orange hue is playful, and aromatic. 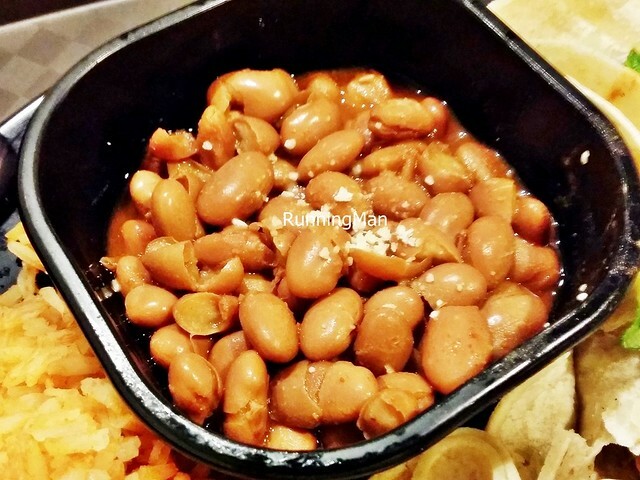 The soft beans are savoury in taste, lending a depth of flavour. 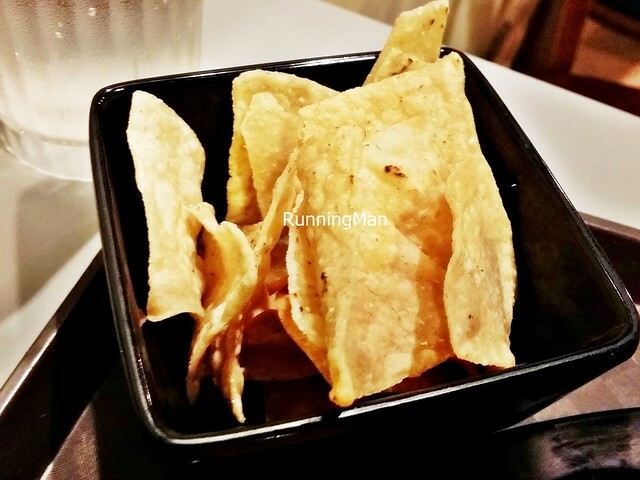 Each meal is also served with a side of crunchy Tortilla Chips, though these are plain, with just a sprinkling of salt. 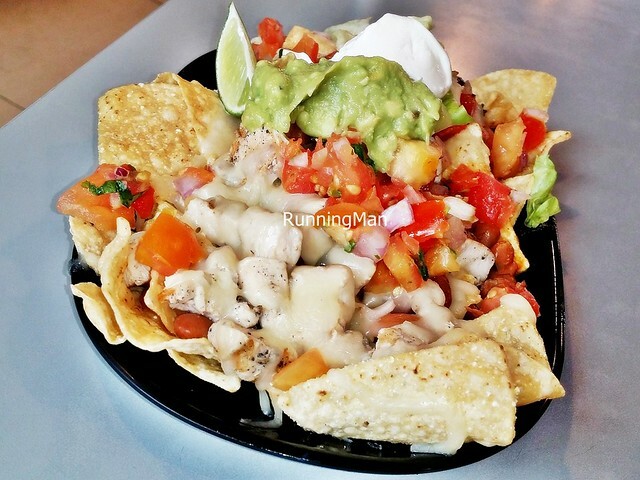 Pair them with any of the freshly made tomato salsa in the salsa bar! They offer 4 different varieties of tomato salsa in the salsa bar, all made fresh daily, and regularly topped up throughout the day. 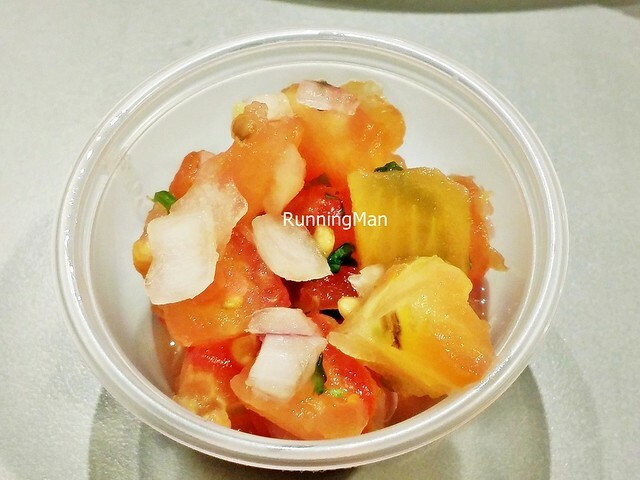 The classic Pico De Gallo / Salsa Fresca features the traditional ingredients of chopped tomato, onions, cilantro, and lime juice. The aptly named Salsa Negra Baja features heavily roasted tomatoes and onions, which gives it a deep, savoury taste. The spicy Salsa 6 Chilies features a secret blend of 6 types of chili along with tomatoes and onions, but I personally didn't think it was overly spicy, in fact, it was rather mild, with only a slight burn. The Salsa De Molcajete features roasted tomatoes, onions, and chili, though this is more mid-range in taste, and heat. 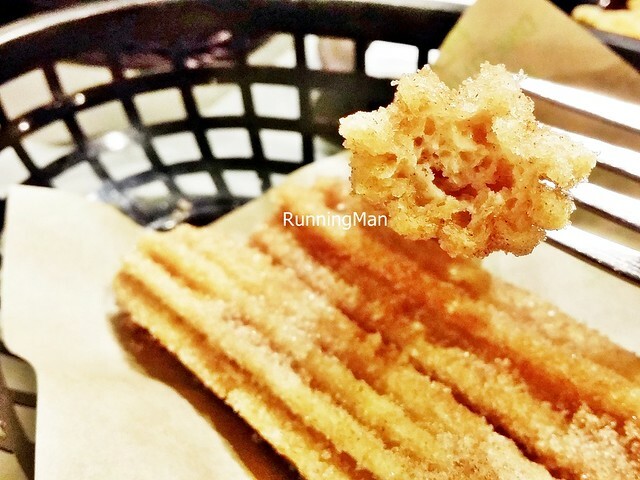 Loved the Churros (SGD $4.50) here, a trio of long, warm, churros sticks, coated in cinnamon sugar. Slightly crisp on the outside, soft and fluffy on the inside, completely satisfiying. Highly recommended! 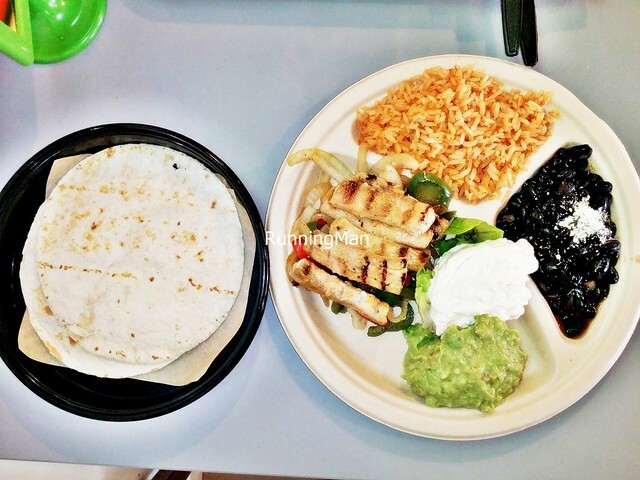 The Fajitas With Mahi Mahi (SGD $14.95) features 2 warm, soft, flour tortillas, along with Mexican rice, black beans, sour cream, and fresh hand-made guacamole, all served on the side. The mahi mahi / common dolphinfish is an ocean surface dwelling fish with firm, white / pink flesh, very similar in texture to tuna fish. While I commend them on using this imported fish, it is naturally frozen, not fresh. The fish is grilled, along with a medley of vegetables such as bell peppers / capsicum, and onions. Overall edible enough, though the fish isn't the best. 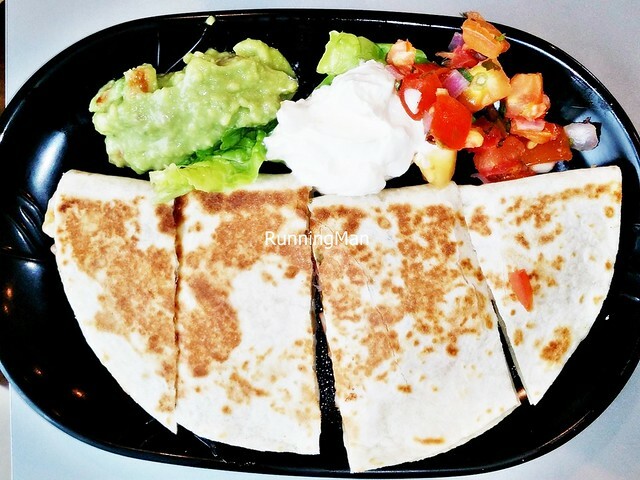 The Quesadillas With Shrimp (SGD $15.95) are, in terms of portion size, the smallest of any dish offered here, but is still just as filling. 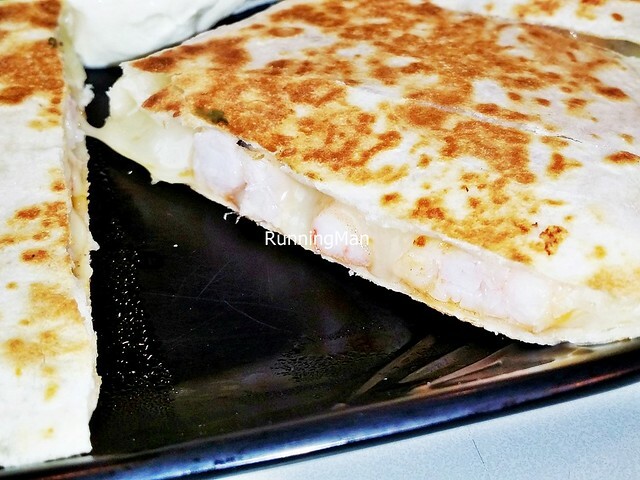 The quesadillas feature warm grilled flour tortillas, stuffed with monterey jack cheese, and deshelled shrimp / prawns. Good for small eaters, but I personally don't feel it's worth the money. Established in 1985, over 30 years ago (! 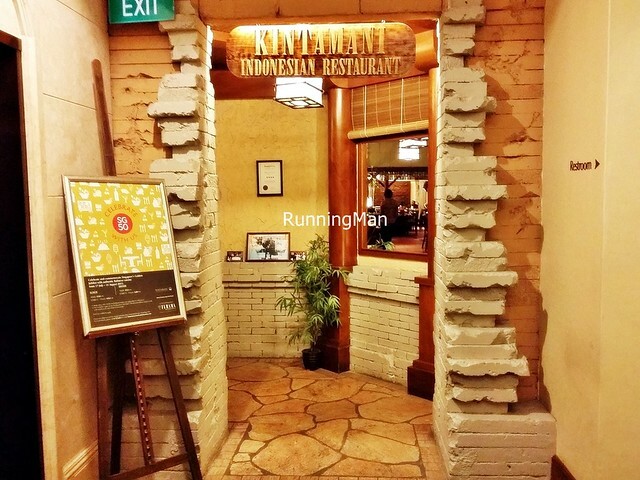 ), Kintamani Indonesian Restaurant is among the oldest restaurants in Singapore. 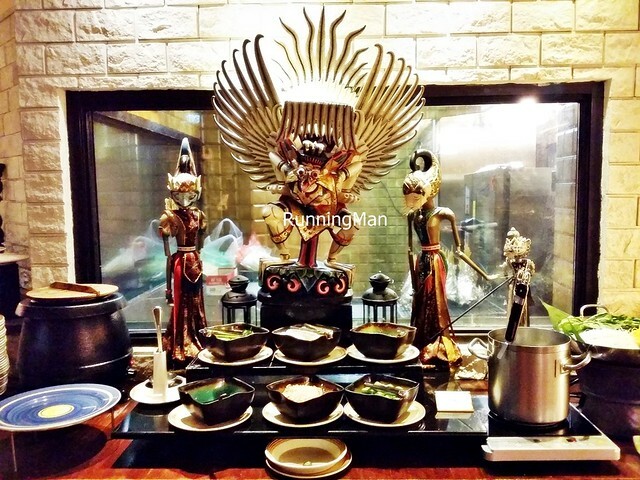 Located in the equally aging Furama Riverfront Singapore Hotel, Kintamani Indonesian Restaurant is known for its Halal Indonesian buffet, with their speciality being Balinese cuisine. 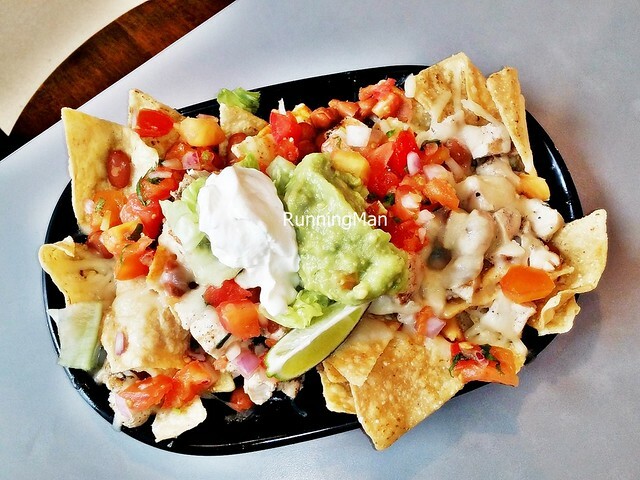 Their consistently decent food, friendly service staff, and decent prices, has seen to the longevity of Kintamani Indonesian Restaurant, and it's still popular for large scale, Halal buffet meals. 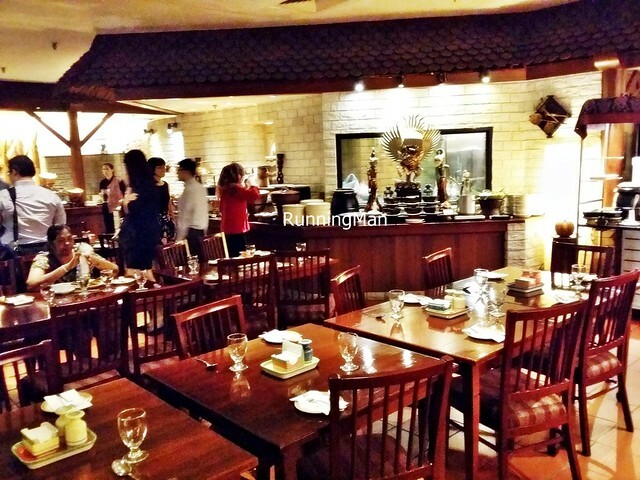 Ambience at Kintamani Indonesian Restaurant is possibly it's weakest point. The spacious but dimly lit interior shows signs of age, though the solid wooden furniture is still sturdy after all these years. Decor is traditional Balinese, ranging from the iconic gate guardians / Balinese gate at the entrance, to the ornate carvings amongst the buffet spread, to the traditional kitchen utensils on the walls. While clean, I dislike the really dark, low ambient lighting. Service at Kintamani Indonesian Restaurant is friendly and efficient. 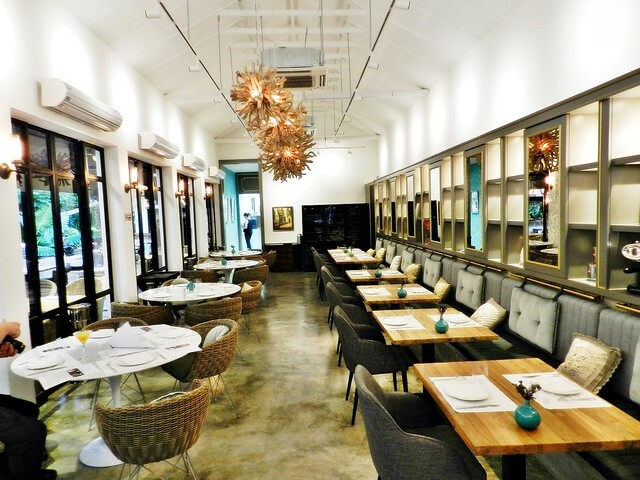 Staff will offer greetings when you enter / exit, and seat diners promptly. Very efficient at clearing away empty / dirty plates, always an important thing in a buffet. Note that they're quite polite, enquiring if you're done before clearing. Food is also regularly topped-up, so the food trays always look full, sufficient for all. However, not all staff can properly answer queries regarding each dish, and ingredients within. 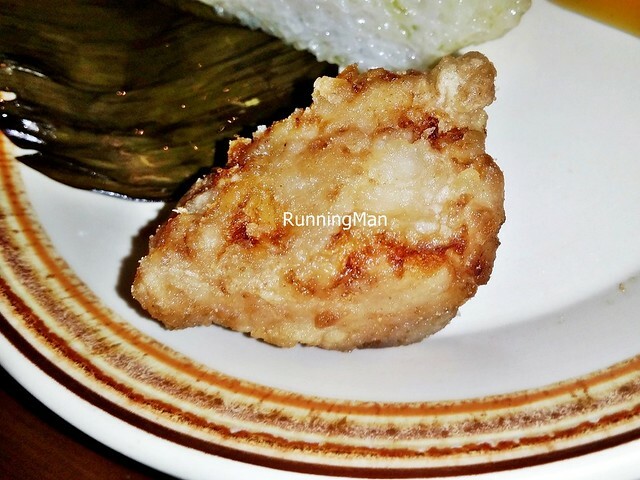 Food at Kintamani Indonesian Restaurant is Halal, with their focus being Indonesian / Balinese cuisine. The food in Bali, Indonesia, is noted for its savoury grilled meats and use of spices, in particular, the 8-spice mixture known as Bumbu. 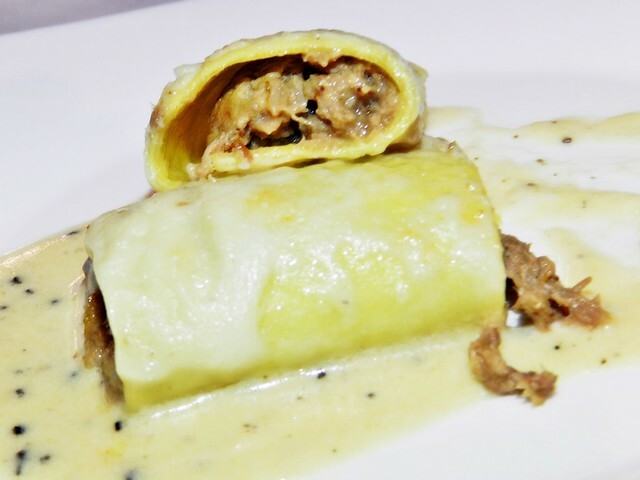 These are all present here, prepared by Chef I Gusti Nyoman Kaler and team. 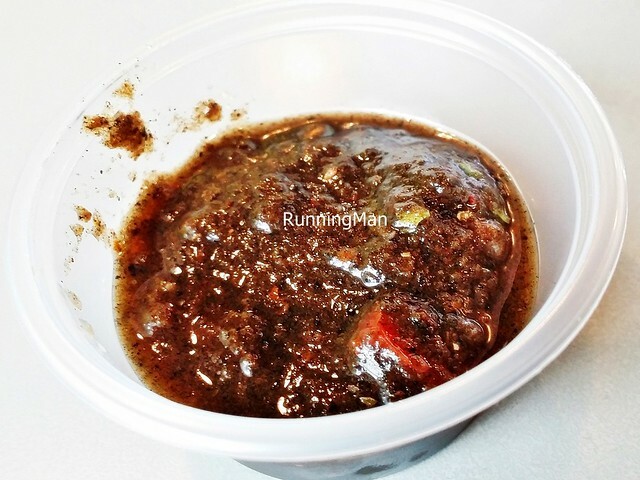 Dishes are generally tasty, heavy on flavourful sauces. 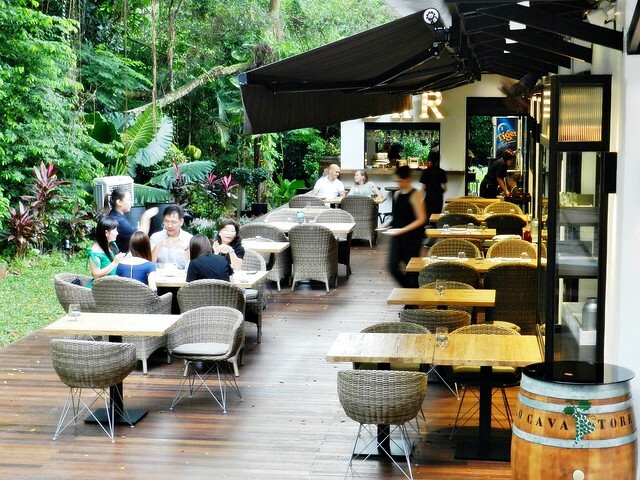 Prices are reflective of a typical buffet, budget about SGD $50 per person for a meal here. The interior is spacious but really dark, and the tables are cramped together. Also, noticed the chairs don't fit nicely between the table legs, which makes walking between tables difficult. These are factory made Crackers Fish & Prawn, which are pretty decent and tasty, and more importantly, crisp. 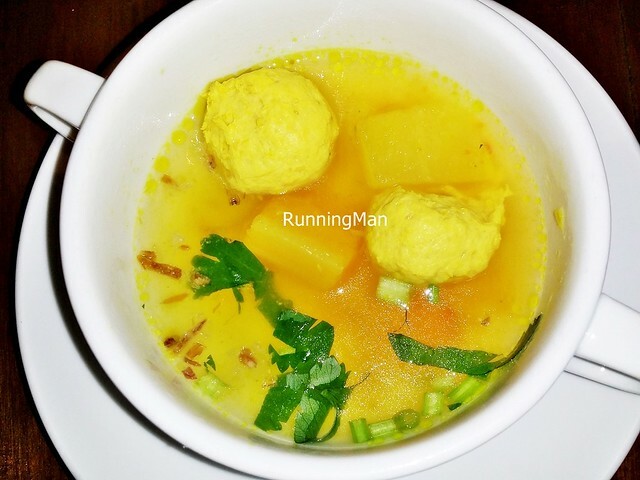 Rather mild flavoured and thin Sop Ayam Bali / Balinese Clear Chicken Soup, though the chicken meat balls within are tasty and tightly packed. 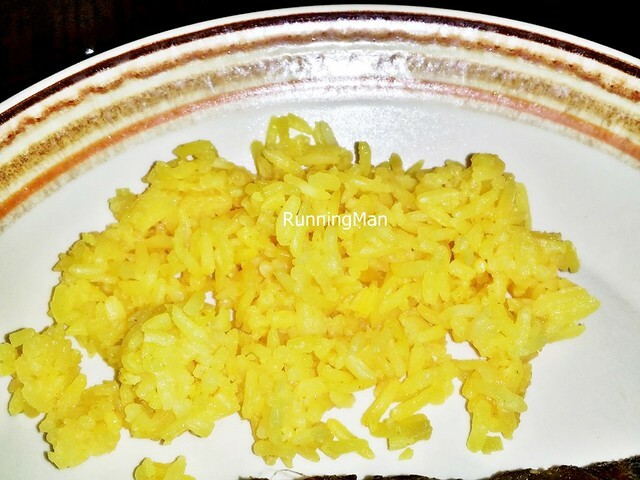 The Nasi Kuning / Yellow Rice is fragrant and enticing in aroma, but some parts of the rice is clumpy. Still, I prefer eating this over the plain white rice. The Fish Colo Colo features fresh chunks of firm white fish fillets, which flake apart nicely when cut. Not too greasy, which I like. But the overall taste is decent at best, the thin batter does little to add flavour. You'll actually have to dip it in sauces to enhance the taste. 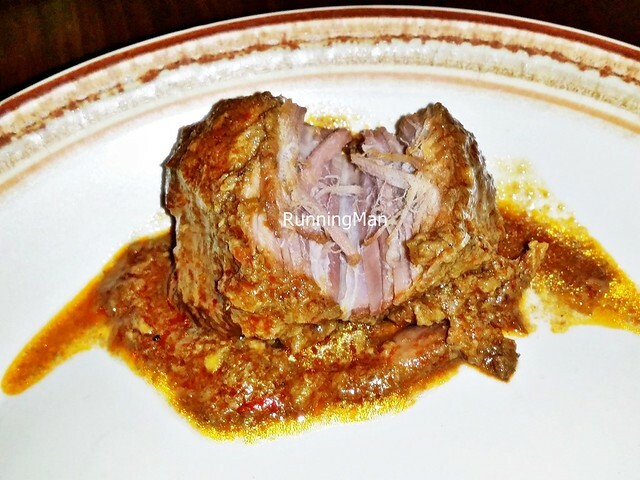 The Beef Rendang is tender and moist, with good savoury meat flavour. But the highlight is the deliciously yummy rendang sauce, which has a good kick of spices and heat. Highly recommended! I felt the Lalapan Sambal Mangga Muda / Spicy Young Mango Salad was decent, with the crunch of the young, unripe mango being quite satisfiying. But the sauce I thought was a little thin in texture, though it has a nice spicy heat. 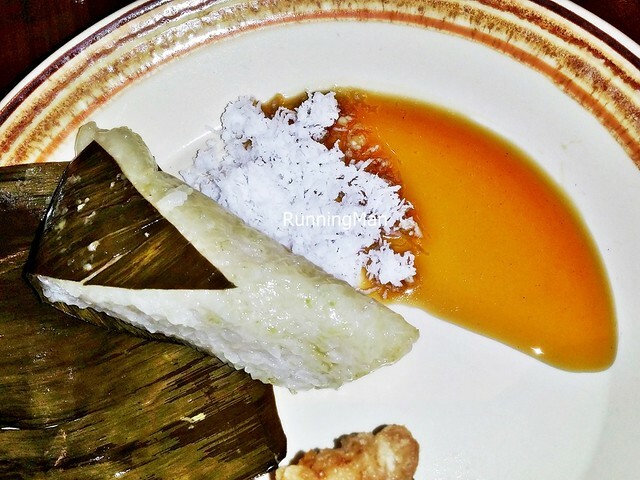 Loved the Lupis here, which is a steamed glutinous rice cake, garnished with dessicated coconut and sweet gula melaka / palm sugar. Really good, I actually found myself eating it on its own, almost like a dessert! Highly recommended! The Satay Chicken & Beef here was the highlight of the entire buffet meal. 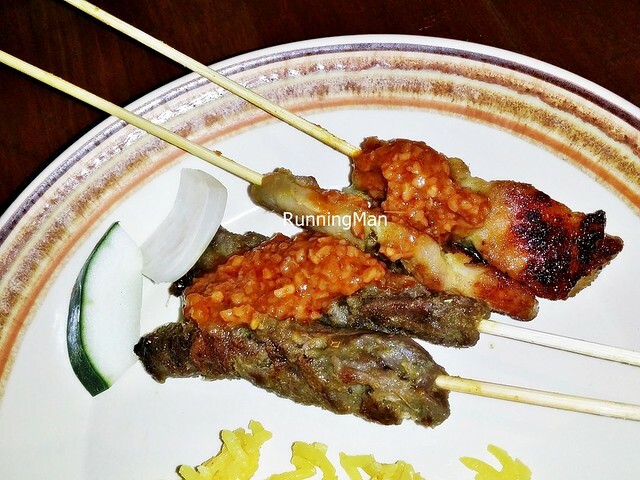 The savoury, perfectly grilled skewers of meat are tender and tasty. People just kept going back for more of these, and it's actually worth to dine here just for these meat skewers! 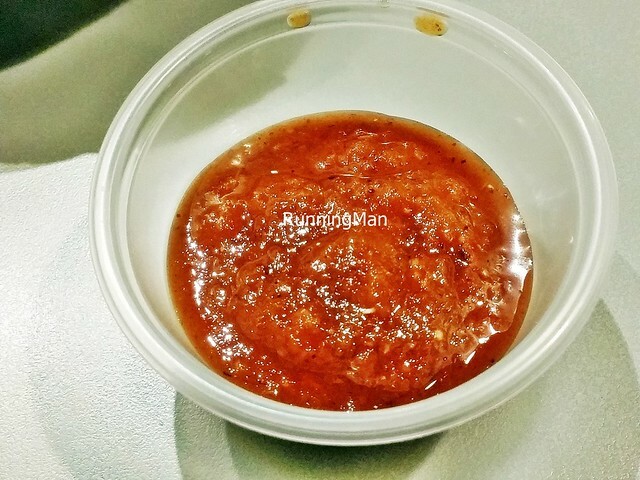 The satay sauce is inconsistent, early on, it's thick, rich and nutty. But after a few rounds, you can tell the kitchen is struggling to keep up with demand, because the satay sauce gets thinner and thinner, and later in the night, the consistency is watery. My suggestion is to go early enough so you get the best satay! Highly recommended! 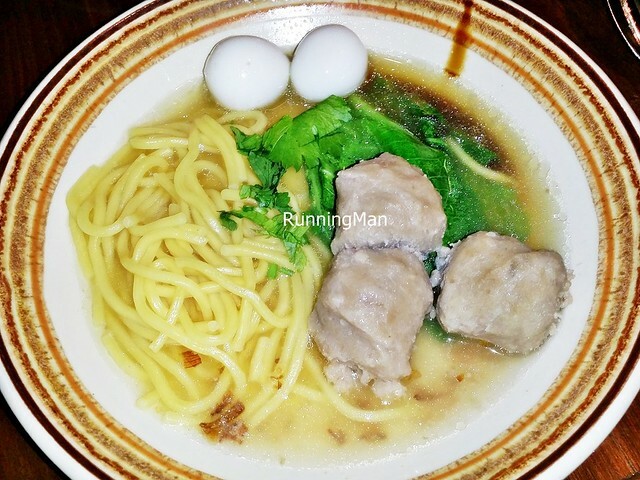 You can cook your own Mee Bakso / Beef Meat Ball Noodles here. 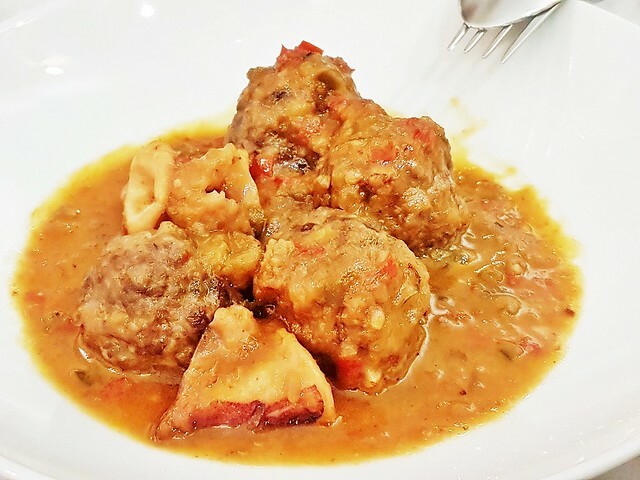 The best part of this dish is the savoury, tightly packed, bouncy beef meat balls, and the tasty soup / broth it's cooked in. I actually got another helping of meat balls on its own! Note that the soup / broth stock already has salt, so refrain from adding any more salt / sauce to it. Highly recommended! 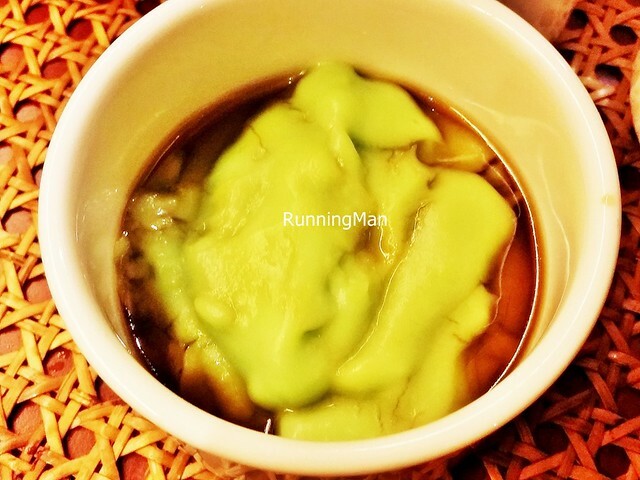 The Lolos Beras / Rice Pudding With Palm Sugar is sweet and tasty, due to the gula melaka / palm sugar. But I didn't like the gloopy / gluey texture of the rice pudding, though the taste is rather fragrant because of the pandan / screwpine leaf essence. The Bubur Injin Bali / Balinese Black Rice Pudding is among the best desserts here. 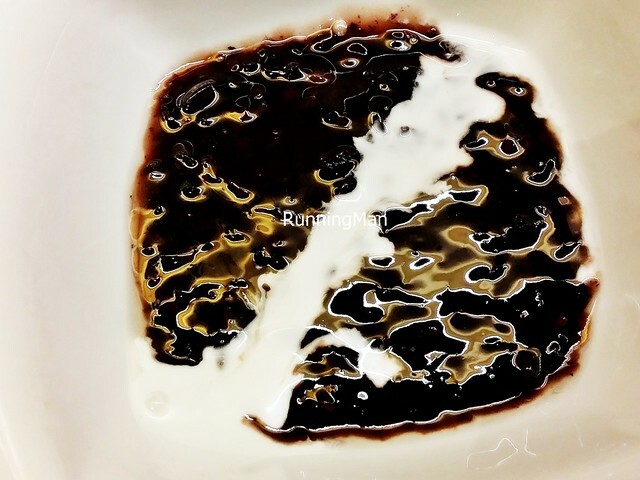 The thick, rich, sweet, black glutinous rice pudding is nicely thick, but very filling. The coconut milk helps to cut through some of the richness, and lends a creamy texture to this delightful, comforting dessert. Highly recommended! 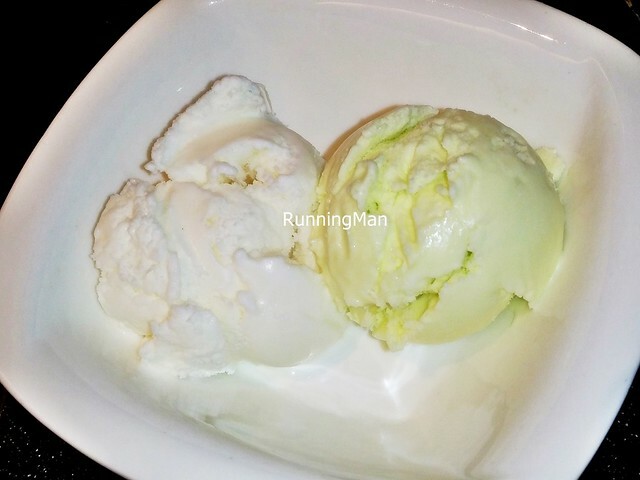 While the taste of both the Ice Cream Coconut & Nata De Coco is essentially the same, creamy, nutty, floral taste of coconut, the difference lies in the addition of pandan / screwpine leaf flavour to the Nata De Coco ice cream. I prefer the straight-forward, natural taste of the normal Coconut ice cream though. Attended with representatives from The Arctic Star, Little Tiny Sun, and Chubby Botak Koala. Budget about SGD $85 ++ per person. Opened in June 2015, the first thing I learnt about La Ventana is that it's distinctly Catalan cuisine, not Spanish cuisine. This distinction is important, because chef and the staff all hail from the Catalonia region, and they consider themselves an independent country not part of Spain, much like the complicated relationship between Taiwan and China. 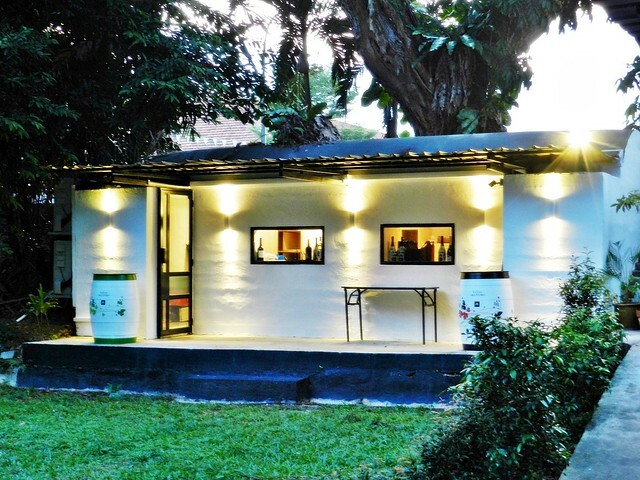 The pride they have in their homeland is evident at La Ventana, the ambience is fantastic, the service personal and professional, the food excellent. 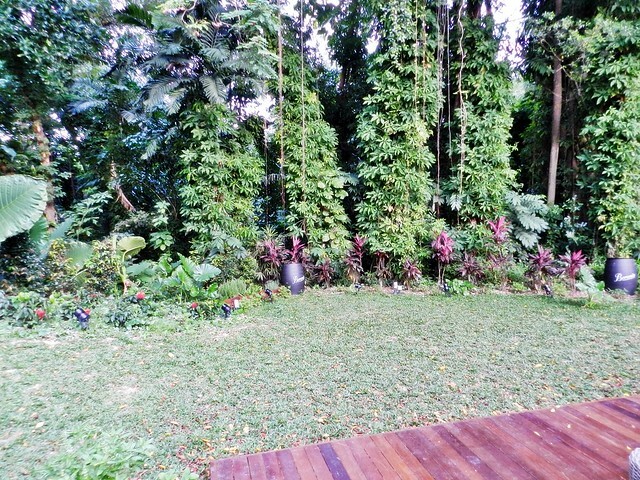 Ambience at La Ventana is quaint and cozy, like a country style home. 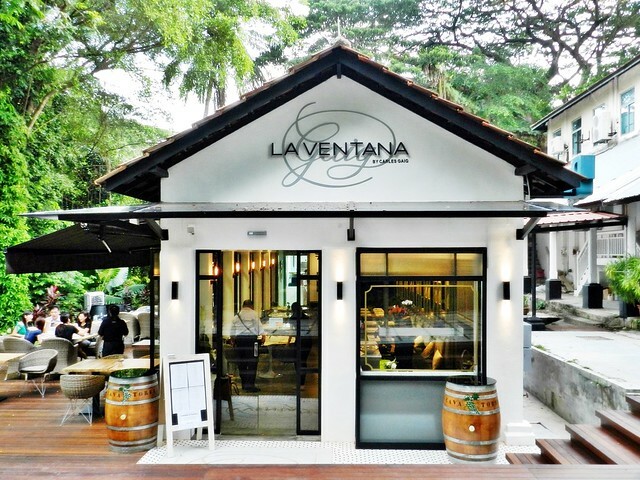 This intimate 80-seater (plus) restaurant is set within the lush greenery of Dempsey Hill, styled to resemble the Barcelona countryside. 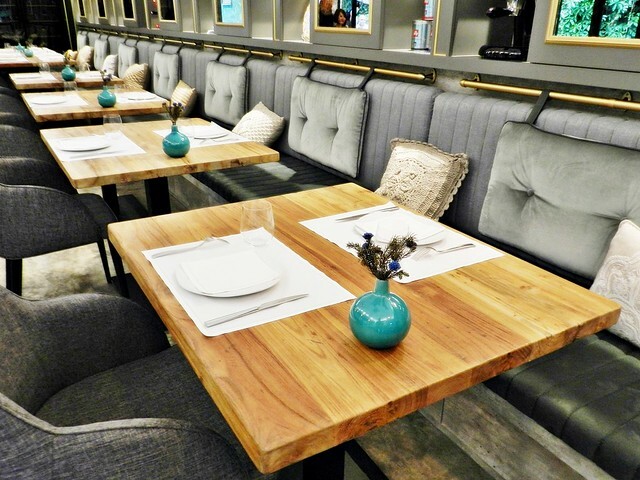 The comfortable, modern wooden and rattan furniture, bespoke decor of wine bottles and handcrafted Catalonia art plates, classical background music from Spain, and nautical colours of blue-green / turquoise, white, wood, and navy, is welcoming with a suitable atmosphere for long, slow meals. 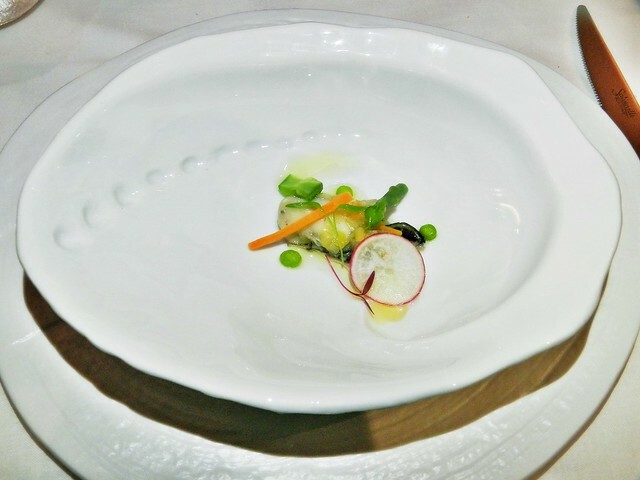 The fine silverware and artfully crafted, intricate dining plates (which change with each course served) are elegant and sophisticated in air, a true fine dining experience. 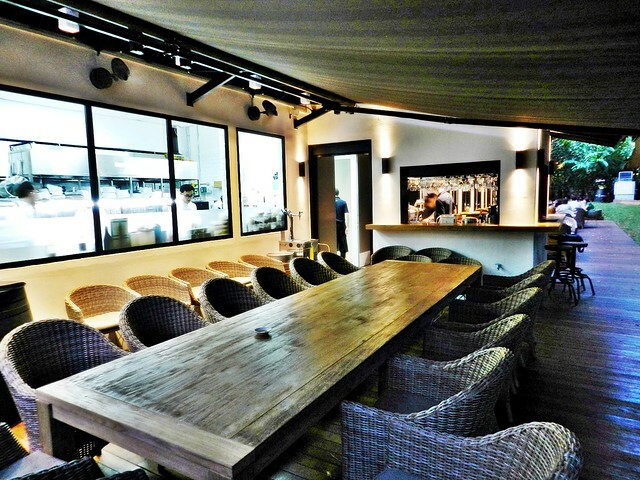 There's areas for indoor dining, outdoor al-fresco dining, lawn dining, and even a private dining area! I understand the event lawn can even be used for live bands, or events such as weddings. Service at La Ventana is personalised, efficient, and professional, as befits a fine dining restaurant. 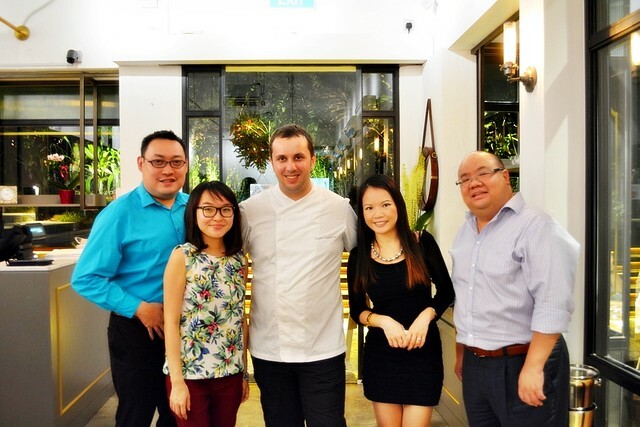 The kitchen team mostly hails from Barcelona and the Catalonia region, while the front of house staff hail from throughout Spain, or Singapore. No problems conversing in English or Spanish. There is an old-world, elegant sophistication to the service, staff will serve all the ladies first, followed by the gentlemen, then briefly introduce each dish and its history. Very knowledgable, I'm impressed. They also come around regularly to check on the progress of your meal, offer more drinks, or proactively enquire if they can clear empty / dirty plates. 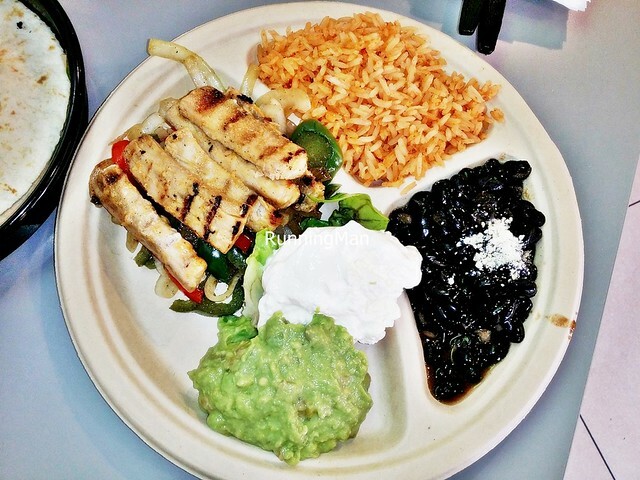 Staff can engage you in conversation, but as meals at La Ventana typically stretch up to 2 hours (or more), having suitable dining companions is a must. 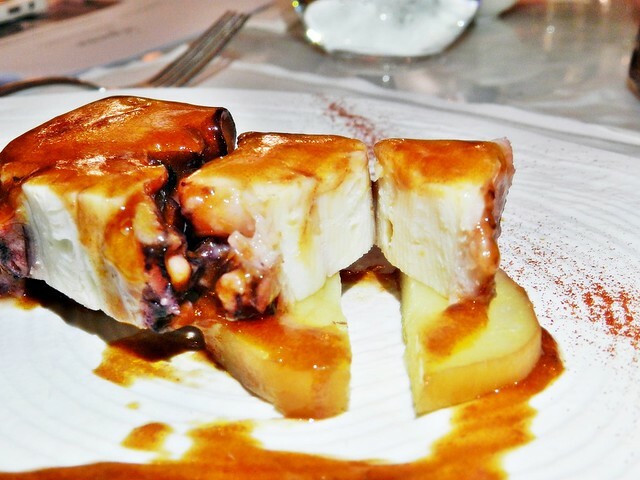 Food at La Ventana is authentic Catalonia cuisine. 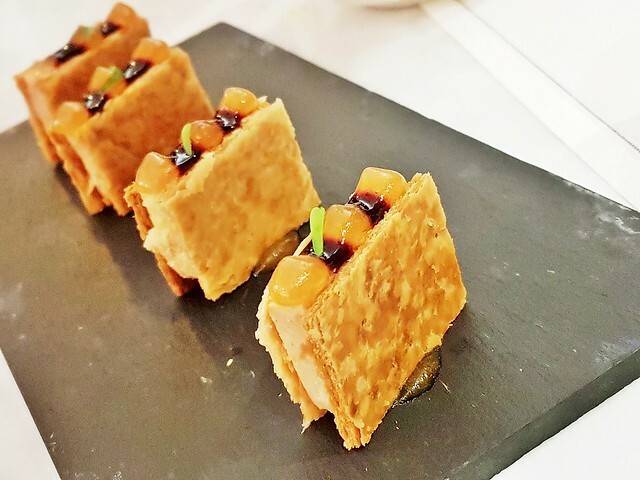 Michelin-starred Chef Carles Gaig, of the famed Barcelona family restaurant Taberna d’en Gaig (which his family established in 1869), set up La Ventana, which is managed by his daughter Nuria Gibert, and her husband Chef Eduard Castellarnau. 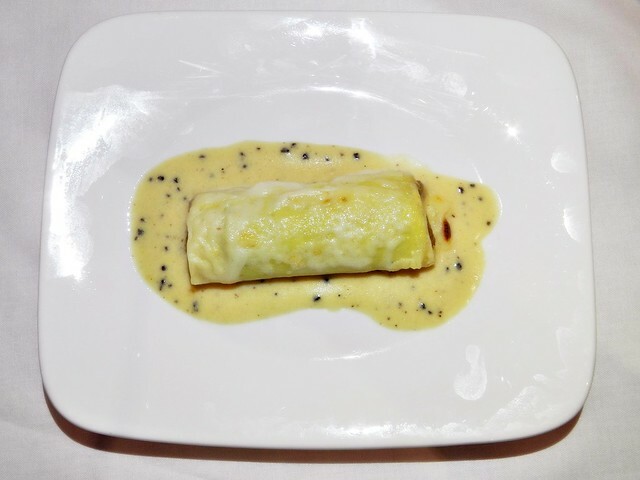 The classic recipes of Chef Carles Gaig at La Ventana reflect the influences of his family, including his mother and grandmother. Dishes are known to engage the senses; with colouful, intricate plating and presentation, aromatic fragrances of herbs and spices, textures which are perfectly executed and compliment, and tastes which are bold, full of flavour. Tapas portions are suitably small, while main course portions are large and could be shared. 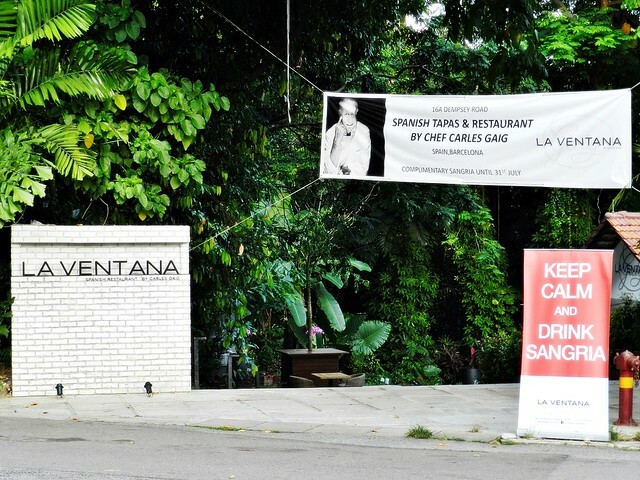 Prices reflect the high-end, fine dining status of La Ventana, budget about SGD $85 or more per person, for a meal here. 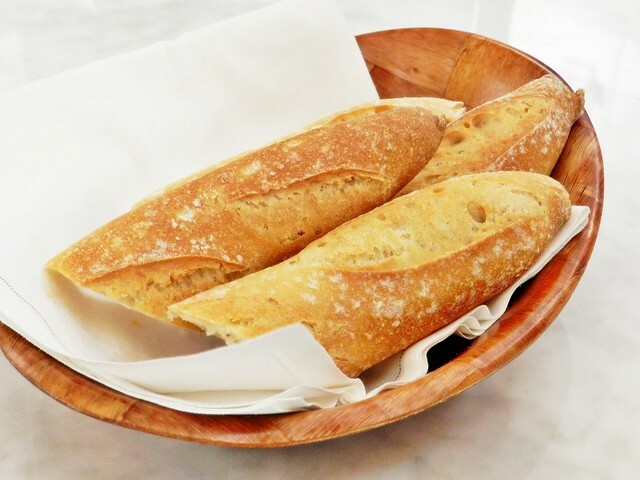 Complimentary Country Bread with Olive Oil is served at the start of each meal, as cooking and preparation times can be rather long, about 15 - 30 minutes or so. The bread is suitably crisp in the crust, and soft within, fragrant with the aroma of wheat fields. 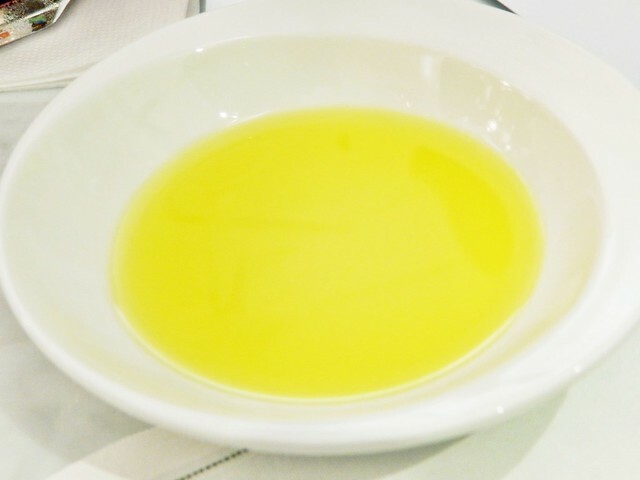 Good quality virgin olive oil as well, which is fragrant and delicious. Noticed they don't serve vinegar with this, although you can request for it. 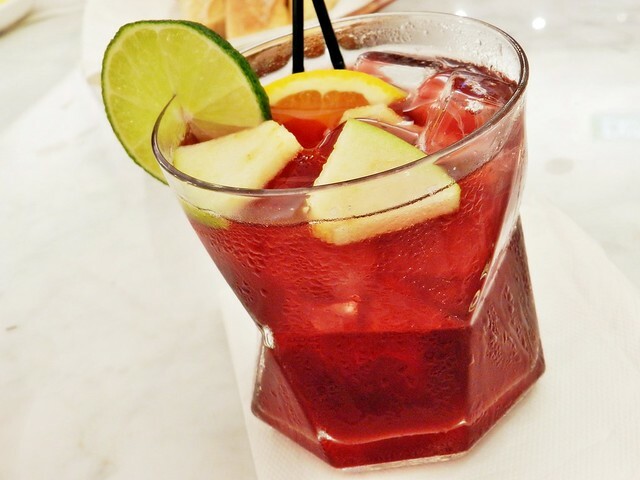 A classic Spanish fresh fruit and wine cocktail, the Red Wine Sangria (SGD $19) is a refreshing blend of house red wine, cointreau triple sec liqueur, martini rosso vermouth, orange juice, lemon juice, and peach juice. Top tasting notes of fruity orange and peach, followed by the mellowness of berries and oak. A house speciality, highly recommended! 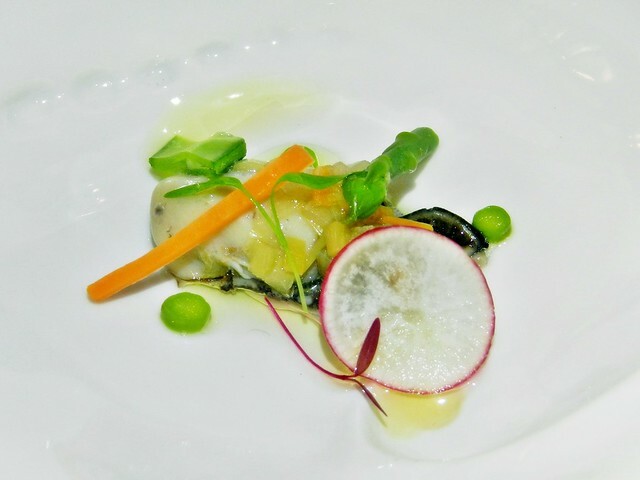 The Oyster Escabeche (SGD $18) features a large, fresh Gillardeau number 3 oyster, treated in a tart, sour, zesty, light marinade, alongside fresh micro herbs and vegetables. Incredibly pretty to look at, especially served within a plate resembling an oyster shell. The Gillardeau number 3 oyster is sourced from the Gillardeau family, a small but legendary family-run oyster farm in Bourcefranc-Le-Chapus, in the Poitou-Charentes region of France. This 3rd grade oyster is plump, luxurious, and creamy (said to be the best oyster in the world), as such, it's highly sought after by many Michelin star chefs, and served in the finest European restaurants. A divine single bite! 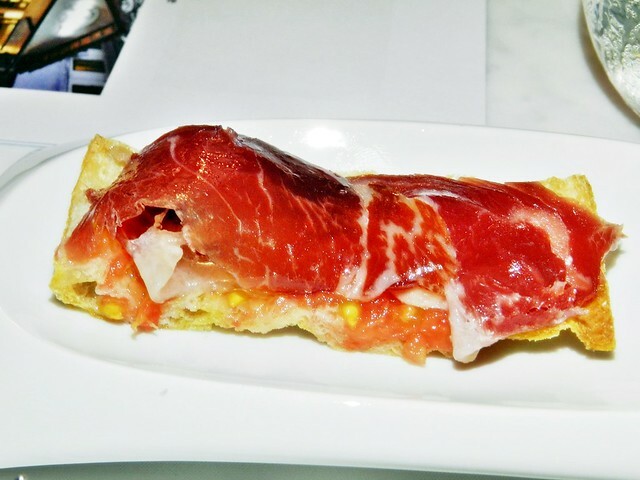 With the Jamon Iberico De Bellota (SGD $26), thin slices of jamon iberico ham, packing a salty, savoury punch, compliment the sweet, juicy tomatoes, and the crisp, wafer-thin Catalan crystal bread. 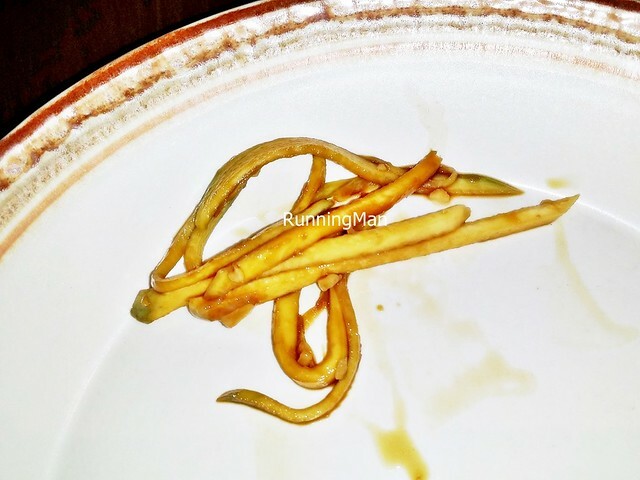 A delightful combination of bold tastes and textures, the gentlemen found this to be very appealing, voting it their favourite appetizer / tapas dish. Plating is clean and modern, like treasure within a little pocket. 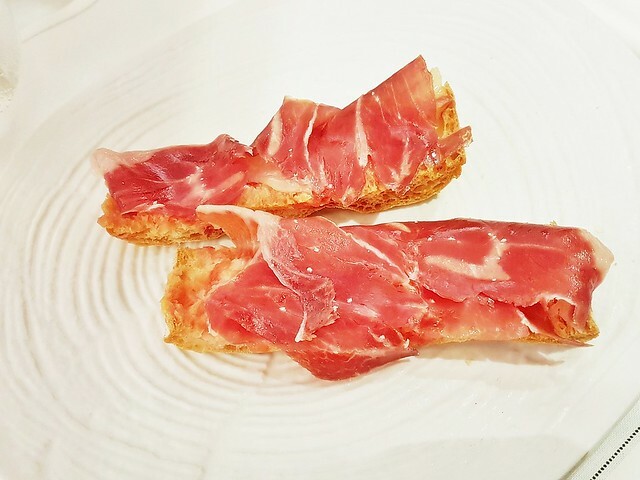 This ham is the highest grade of jamon iberico ham available in Spain, sourced from 100% acorn fed, free-range black Iberian pigs, which roam amongst the oak forests. 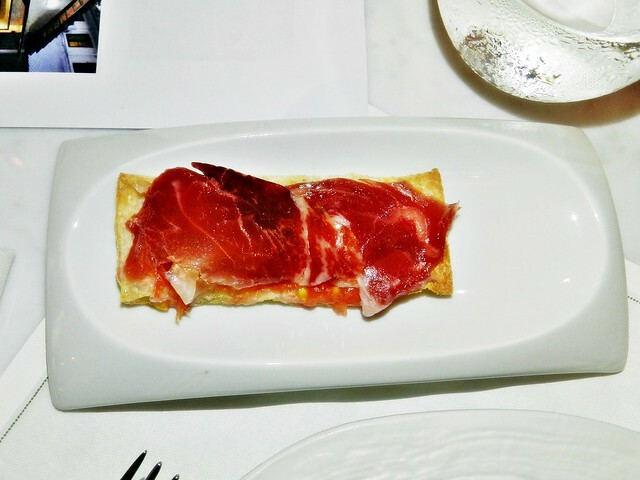 Cured for 36 months, the marbling results in the jamon iberico ham taking on a smooth texture and rich taste. Slightly messy to consume, but so good! 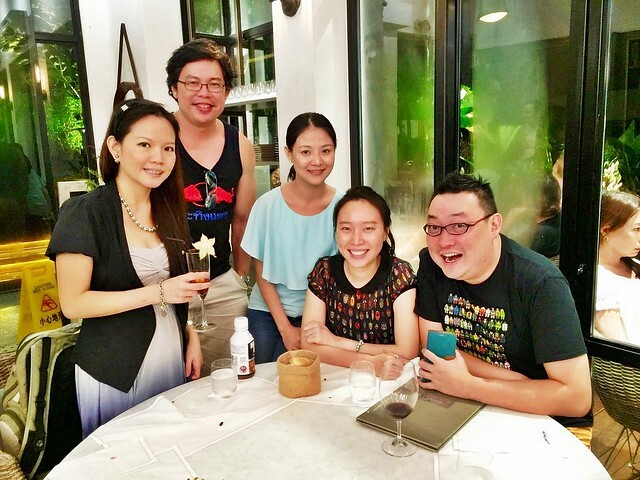 The ladies voted the Lobster Coca (SGD $19.80) as their favourite appetizer / tapas dish. A coca is a traditional, fine puff pastry from Catalonia, and it can be savoury or sweet, presented in either a closed, open, or plain style. It's usually associated with various holiday celebrations. 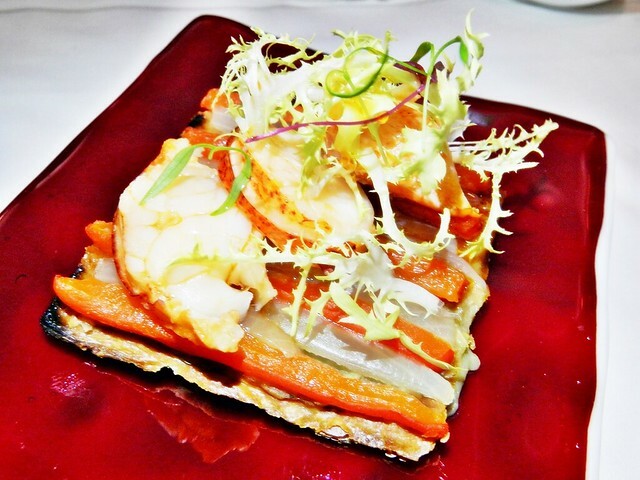 Here, chef has presented an open, savoury coca, with a wafer-thin, crisp texture, topping it with aubergine / eggplant puree, roasted red bell peppers / capsicums, and chunks of fresh deshelled lobster meat. All 3 main ingredients are commonly used in the everyday kitchens of Catalonia. Unusual presentation, on a raised, vibrant red platform. 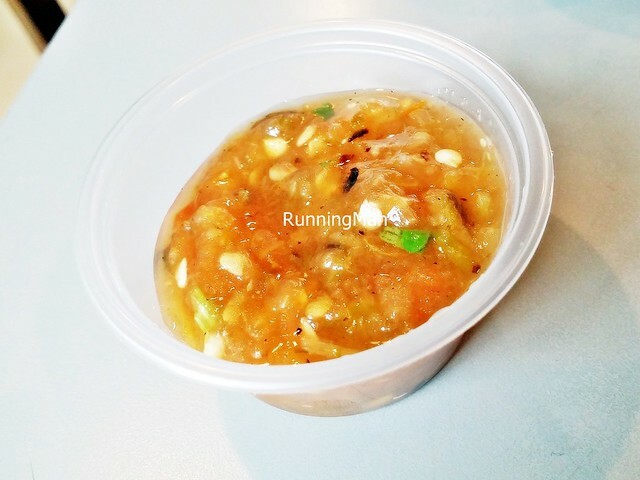 There is a refreshing sweetness to this dish, despite its savoury status. Very good! My personal favourite of the evening was the Roasted Octopus (SGD $38). Served alongside herb infused waxy potatoes, and sprinkled with Spanish smoked paprika, the slow roasted octopus meat is tender, almost creamy in texture. 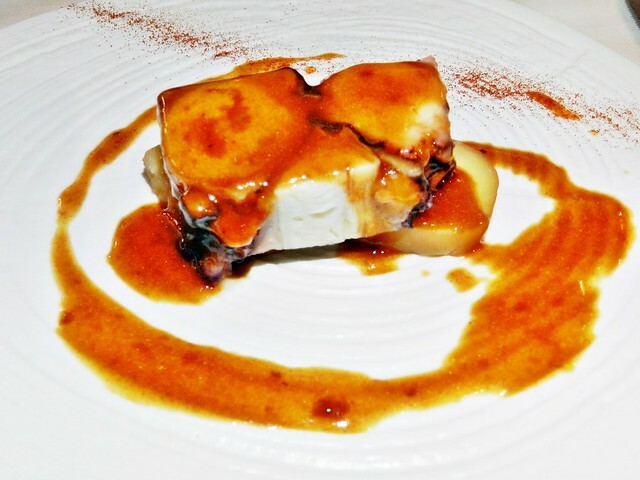 Also known as Pulpo Gallego, this dish originated in the Galicia region of Spain, and the key to this straight forward, simple dish is the freshness of the octopus, as well as the chef's skill in timing during boiling to get it tender. 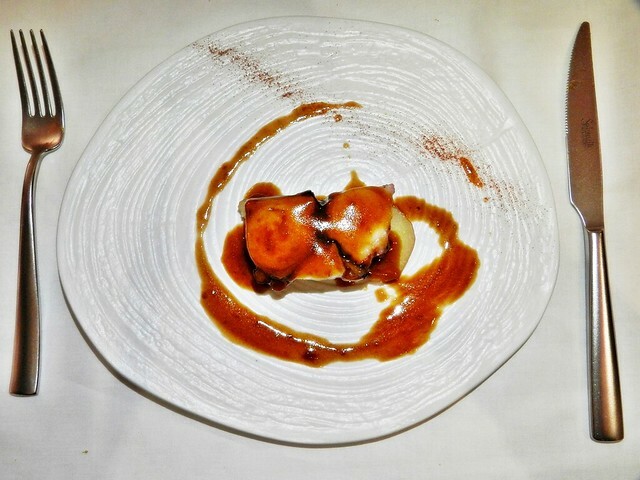 As the traditional version can be rather bland, here, chef has chosen to coat it with a savoury, sweet gravy that lifts the entire dish, giving the succulent octopus a lot of flavour. Plated on a tree trunk pattern dish, which looks elegant. Loved it! 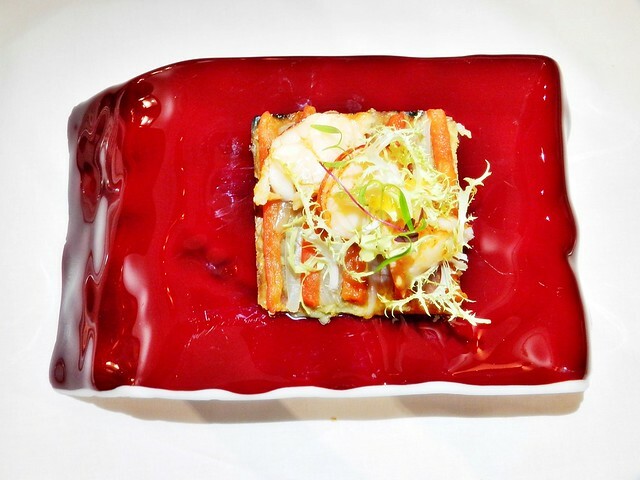 The Canelon Since 1869 (SGD $12) was the 1st dish ever created by chef's family, over 4 generations ago, when they first established their restaurant. The original, classic recipe has not changed in all these years, as in chef's words, "It's good enough". 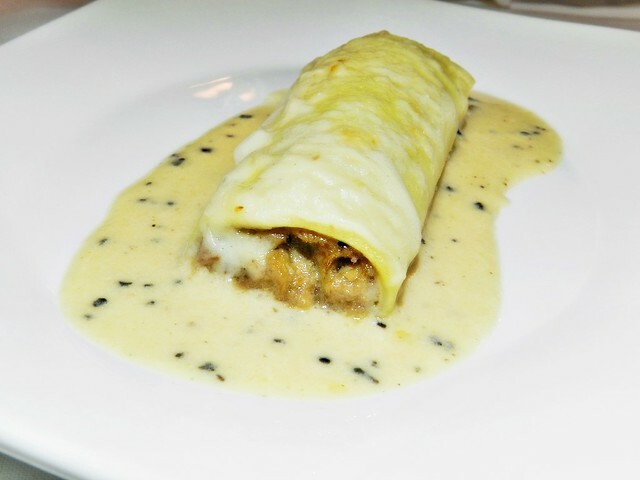 Featuring a traditional cannelloni (a baked cylindrical pasta covered in sauce), stuffed with foie gras, minced beef, minced pork, and soaked in truffle cream, the dish is savoury, meaty, creamy, luxurious, full of flavour, and utterly decadent. Simple, straight forward, clean plating, but rather messy to eat. The Canelon Since 1869 is chef's proudest dish, a true family legacy, and the dish he will first ask you about (if you order it). The fragrant aroma, and tender meat filling has rightly won many fans around the world, and is one of the signature dishes of La Ventana. While it wasn't our favourite dish, we all agreed that it's very good. Worth ordering! 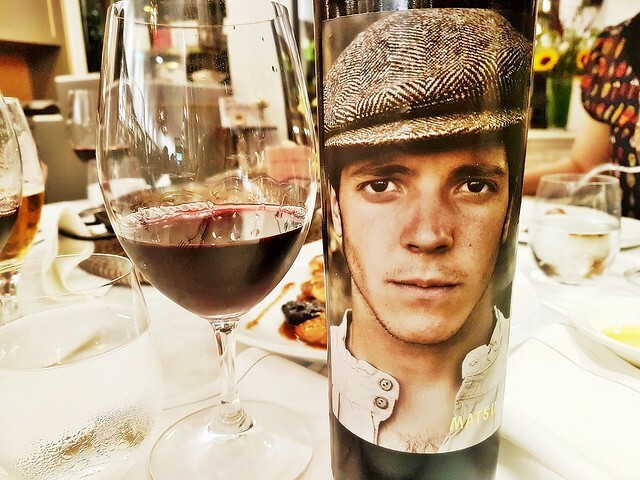 The sommelier recommended I try the Red Wine - Tempranillo - Matsu El Picaro 2014 (SGD $21), which he said would pair well with the upcoming courses (it complimented exceedingly well). Noted that they served it professionally, letting you smell / taste the sample before pouring the rest of the glass. 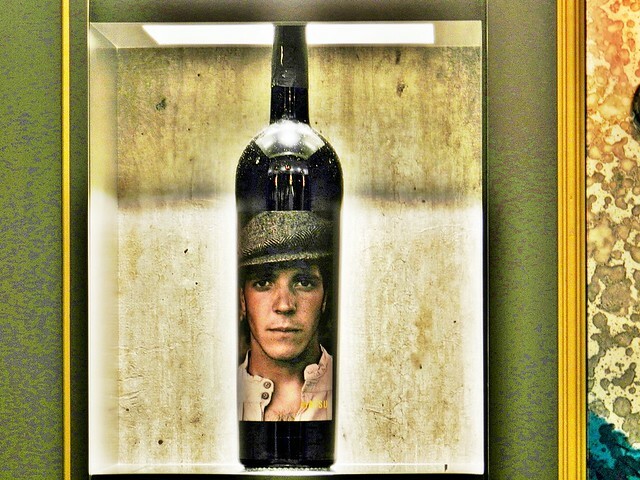 The Matsu El Picaro 2014, whose name means 'the rogue' or 'the rascal', is a youthful spirit which is produced in the vineyards around the town of Toro, Zamora province, in the Castile And Leon region of Spain. It's a Tempranillo red wine, which is made with an early ripening black grape variety, and has a full body with a deep vibrant colour. To create the Matsu El Picaro 2014, grapes are harvested from mature vines (of over 50 years), but aged for only 3 months in oak barrels, preserving the natural, sweet, fruity flavour. 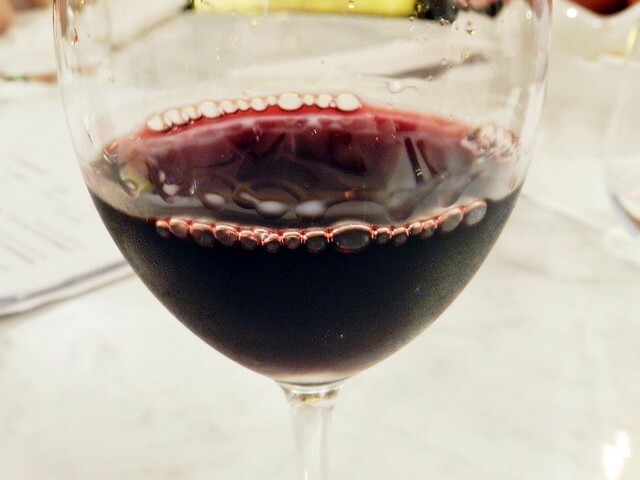 The Red Wine - Tempranillo - Matsu El Picaro 2014 has a vivid, ruby red and deep purple colour in the glass, with an aroma of ripe blackberries, raspberries, dry spice, and subtle hints of fresh cocoa and forest leaves. The body is full, robust, refreshing, and smooth on the palate, with ripe tannins, a pleasant astringent mineral grip, and a mild acidity. Taste is fresh and sweet, primarily of berries (raspberry, blackberry, blueberry), and the complex, unique taste is pleasing. No surprise that it's won many fans! Its complexity also means it pairs well with a wide variety of dishes, including red meats (beef, lamb, pork, pigeon, kangaroo), tomato sauces / stews / soups, sharp cheeses (cheddar, blue, gouda, asiago, limburger), and even spicy food! 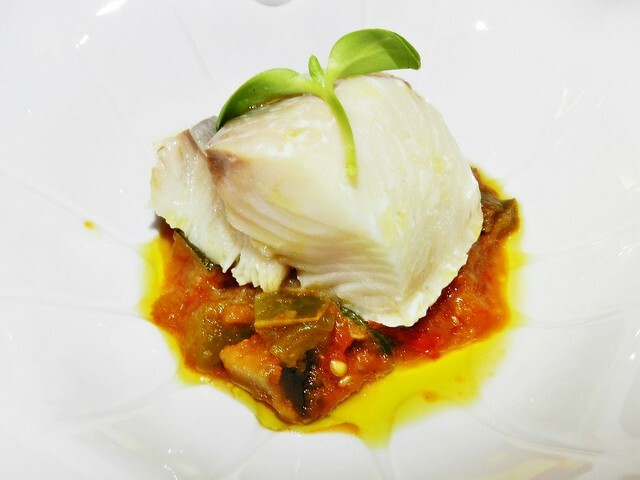 The Black Cod & Samfaina (SGD $38) features a fresh, flaky black cod fish, sourced from Alaska in the United States Of America, slow cooked for hours till tender. 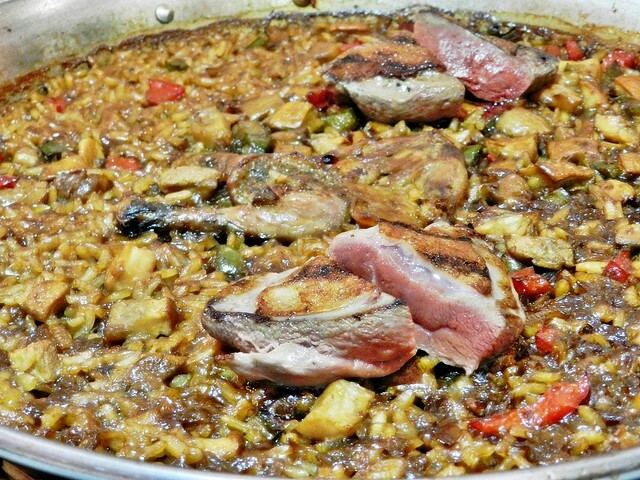 Served on a piquant bed of samfaina, a Catalonia style vegetable ragout / ratatouille made with vegetables popular in Barcelona, including aubergine / eggplant, zucchini, garlic, onions, bell peppers / capsicums, and porcini mushrooms, all stewed till soft in a fresh tomato sauce. 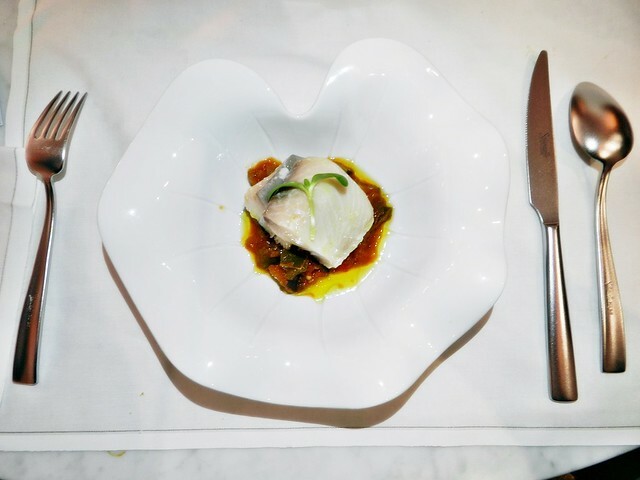 Also known as Bacalao / Bacalla Amb Samfaina, the creative plating resembles a large leaf. However, I felt this was the weakest dish I had here. Don't get me wrong, it's a decent dish, but as the most average dish in the midst of excellent dishes, this was the most forgettable. Plus, I've had much better cod fish elsewhere. I loved the Crispy Suckling Pig (SGD $38)! Featuring a large boneless slab of suckling pig, with tender and moist pork meat that isn't gamey in taste! Topped with a thin, crisp, savoury skin, which cracks beautifully. A tart, sour sweet strawberry salad is served alongside, and the sharpness of the vinaigrette pairs well with the savoury sweetness of the pork. 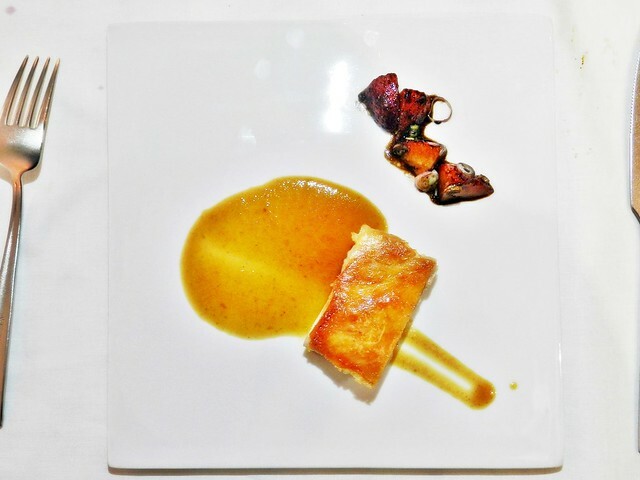 Plating is clean and modern, with the square design offset by the gravy swoosh, and the diagonal plating of ingredients. 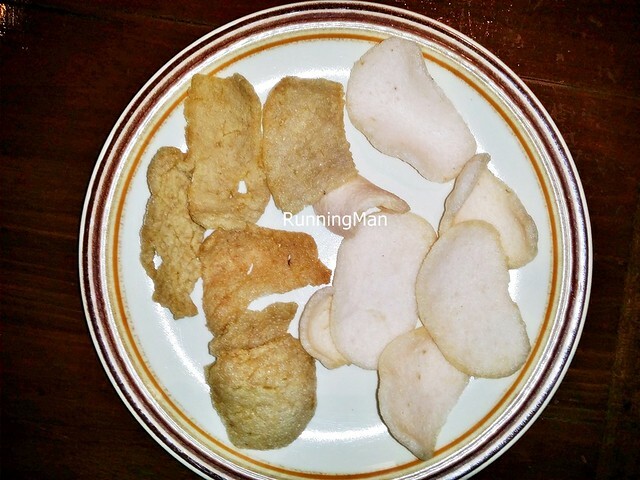 The pork skin has a thin layer of fat, which is easily removed if you don't want it. Absolutely loved this dish, which left me wanting more! Highly recommended! 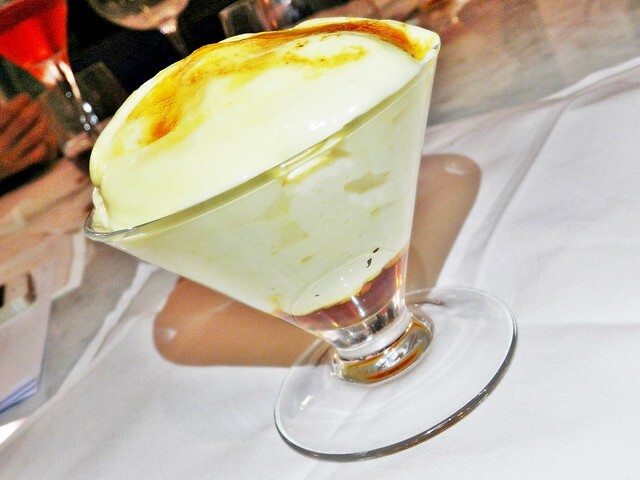 The oddly named Our Catalan Creme Brulee (SGD $18) is a divine dessert! Every part of the traditional dessert is made from scratch. The light, airy espuma (foam) simply melts in the mouth, coating the palate with a pleasant caramel flavour that is light, not overpowering. The punchy sour lemon caramel at the base lends a tangy citrus flavour, mix it well together to give the dessert some zest! 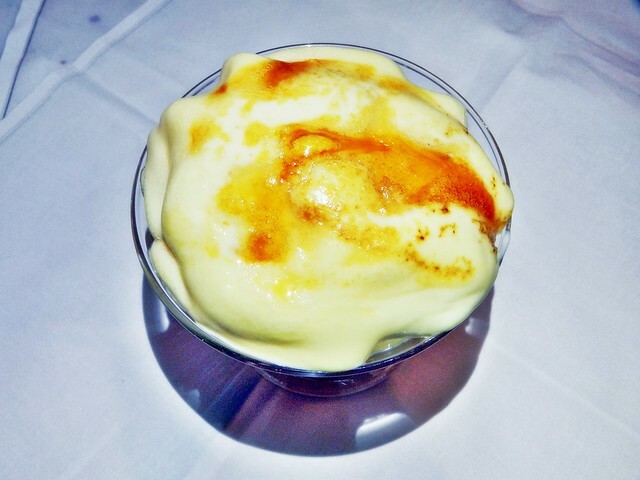 The cream custard base is light and refreshing, allowing you to taste the other components of this creme brulee. Finally, the ice cream toffee hidden within is like a buried treasure, lending a new depth of sweetness. 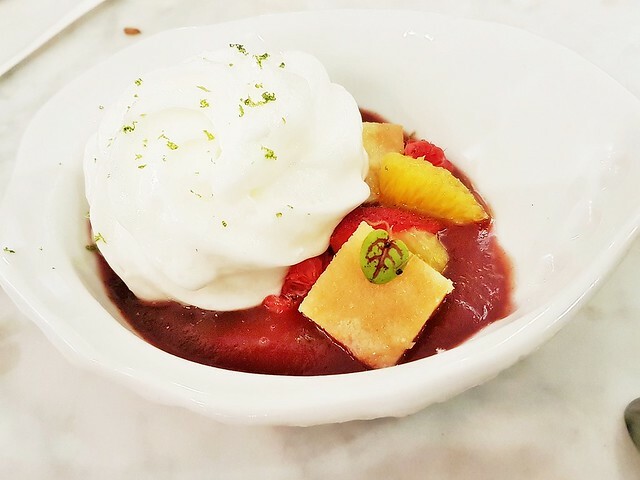 Those who prefer something light may find this dessert cloying, despite the zesty citrus notes. The generous portion threatens to spill over the sides of the large glass it's presented in, but when you start, you can't stop, going back for spoon after spoon of this creamy, addictive creme brulee. Worth ordering for those with a sweet tooth! La Ventana Chef Eduard Casterllarnau came by to greet us, and ask for feedback on the meal. He speaks with pride about the food, and his family traditions. 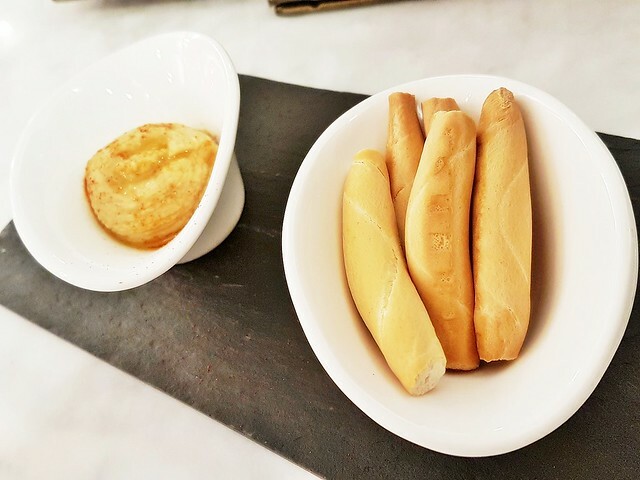 But I find myself thinking, would the general public of Singapore accept such classic, authentic Catalan food, unusual as it may be? 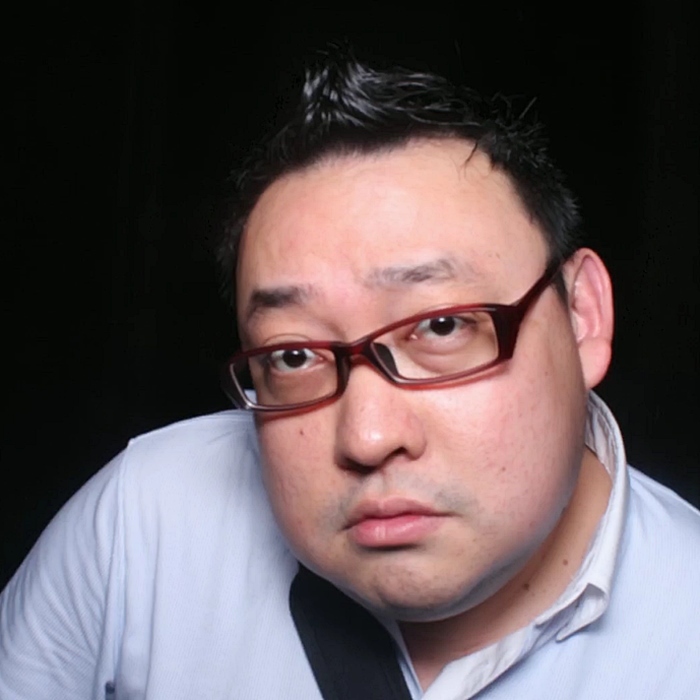 Or would it eventually be toned down to suit local palates? The answer lies in the unknown future, but I hope standards remain as honest, true, and authentic as they do today, even if it means paying a premium for it. 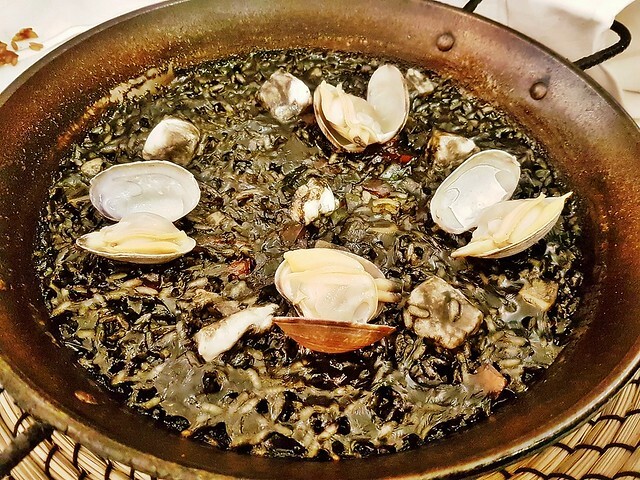 Overall, the combination of incredibly tasty, authentic Catalan cuisine, lovingly prepared with premium ingredients, served by friendly, efficient staff who make an effort to personalise the dining experience, all within a cozy, relaxing setting, makes every visit to La Ventana worthwhile. Well worth the top dollar it commands, my dining experience at La Ventana is, thus far, the most memorable meal I've had in 2015. I'll visit again for more. Update Jun-2016: Almost 1 year later, and I've finally returned to La Ventana. This time, to celebrate friends embarking on new journeys; new jobs, new studies, new life in other countries. I'm pleased to find that La Ventana has maintained its premium fine dining status, with ambience, service, and food as good as before. 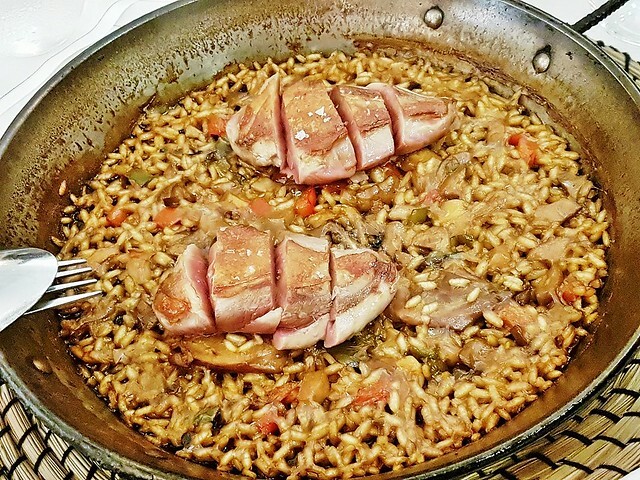 The authentic Catalonia cuisine (not Spanish cuisine) here remains as tasty, traditional, and beautifully plated as ever. Excellent! Finally got to drink my favourite red wine again! 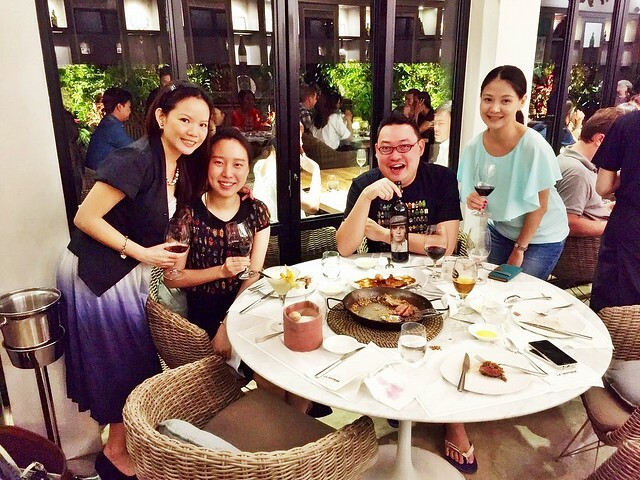 The Red Wine - Tempranillo - Matsu El Picaro 2014 (SGD $84) is no longer being sold by the glass, but by the bottle. Still as roguish and youthful as ever! Wish I could find this more easily in Singapore! 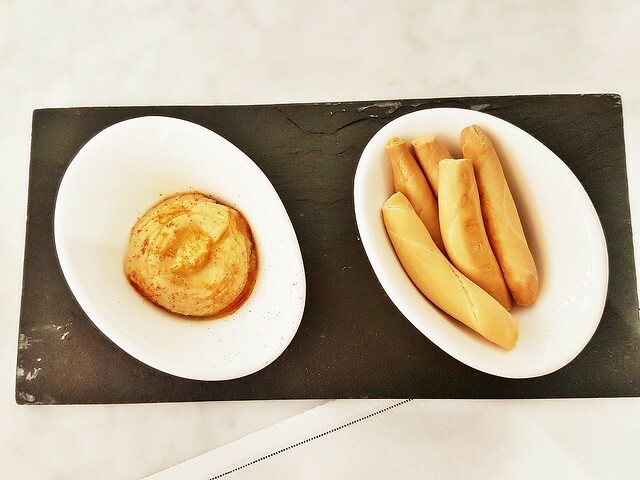 If you're lucky (or unlucky, depending on how you see it) to be alone at the table, waiting for the rest of your friends to show up, staff will serve you the Breadsticks & Lentil Dip (SGD $ Complimentary). Crisp, frim breadsticks, fragrant with good flavour, paired with a thick, creamy, grainy lentil dip, which tastes very similar to the Mediterranean hummus dip. Good! 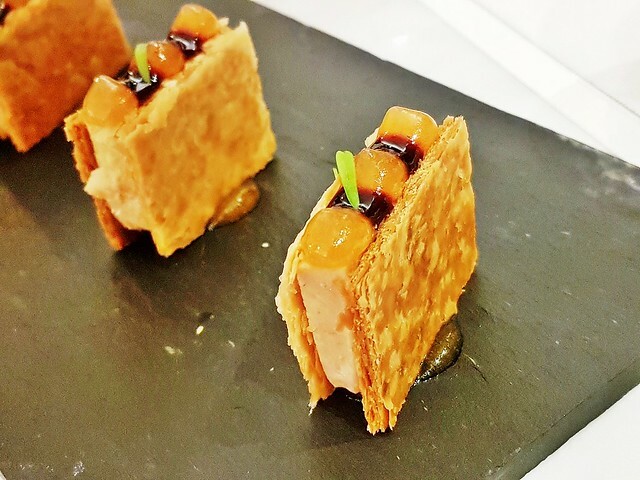 The Foie Gras Terrine Cookie (SGD $18) has a slab of rich, creamy smooth duck foie gras terrine, sandwiched between crisp, flaky puff pastry, topped with apple gel and blueberry gel. The sweet savoury flavour will appeal to most! 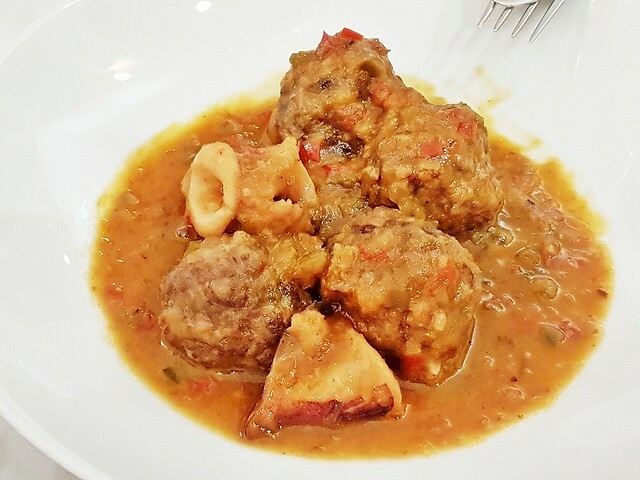 The Surf & Turf Beef Meat Balls & Baby Calamari (SGD $18) feature tightly packed, savoury and moist beef meat balls, along with fresh, bouncy calamari squid, in a savoury salty, rich and meaty gravy. Decent enough, but not outstanding like other items on the menu. 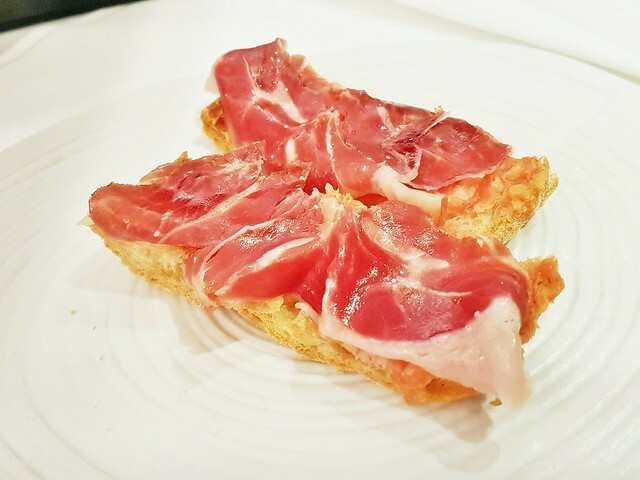 Everthing about the Jamon Iberico De Bellota (SGD $26) is the same as before, a testament to their excellent consistency in quality! Just as good! 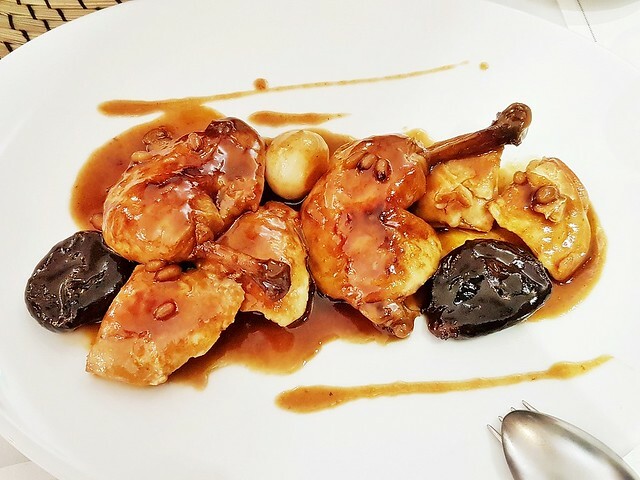 The Catalan Roasted Pularda (SGD $22 / $32) features either a whole or half pan-roasted Bresse chicken, in a savoury salty brown gravy, with tender prunes, sweet apricots, and crunchy pine nuts. 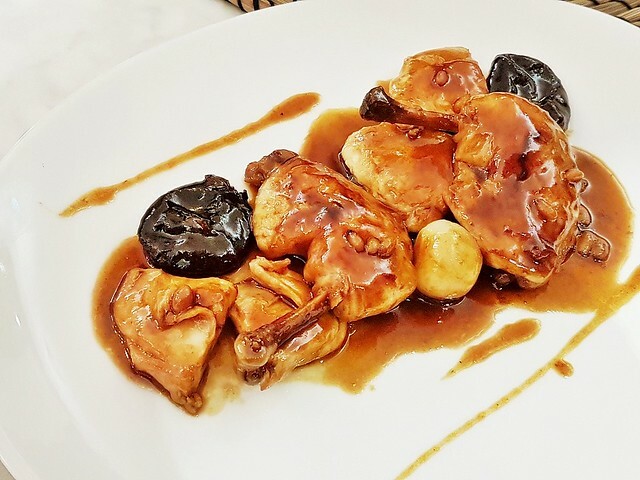 The chicken itself is tender and moist, with savoury sweet flavour, and holds a unique appellation d'origine contrôlée (AOC) status. 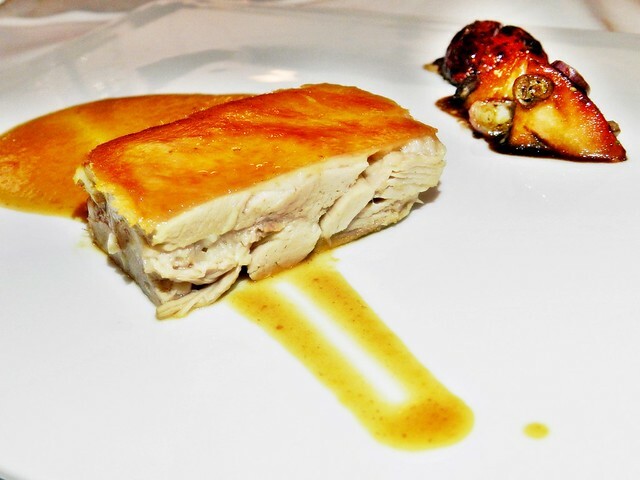 This means the chicken is a premium breed, sourced only from the region of Bresse, in Eastern France. It has been described as "the queen of poultry, the poultry of kings". Highly recommended! 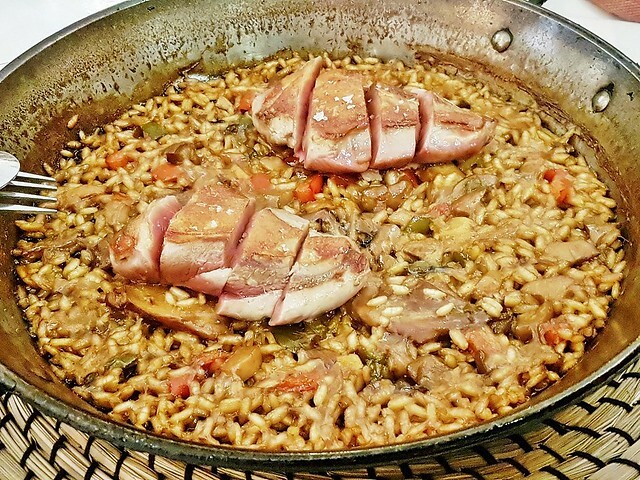 While the taste of the Pigeon Paella (SGD $39) is just as consistently good as before, they have increased the portion size, serving with 2 pigeons instead of just 1. 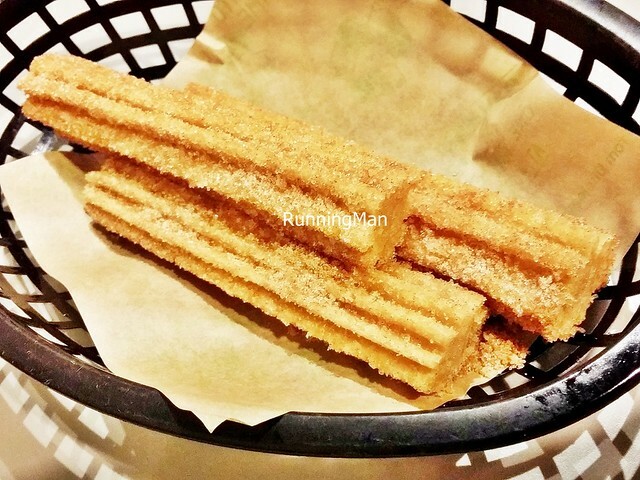 And while the price has also increased by SGD $1, this dish is much more value for money now, I would order this again! 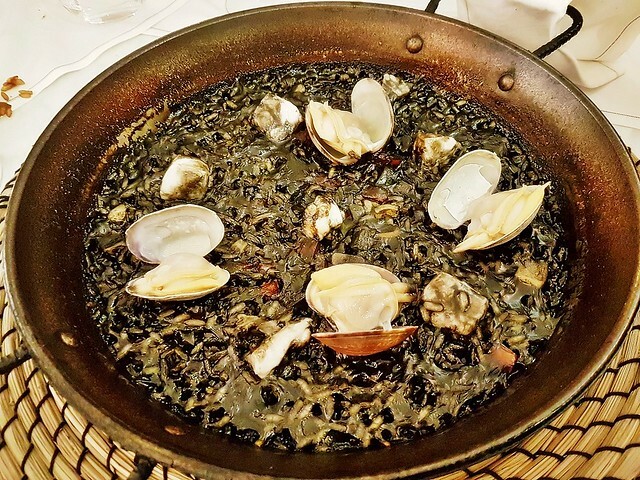 The Squid Ink Paella (SGD $38) has fragrant carnaroli rice, infused with squid ink, giving it an earthy flavour with a hint of bitter taste at the finish. 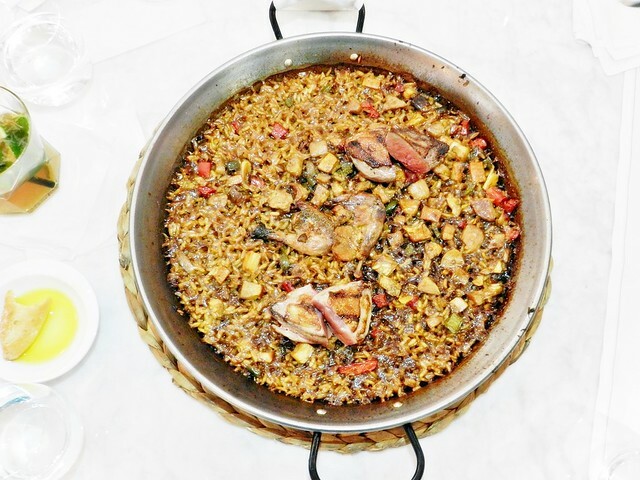 Sprinkled with fresh deshelled slipper lobster / crayfish meat, and fresh raw clams, the combination of sweet seafood and savoury earthy bitter paella rice is delicious. 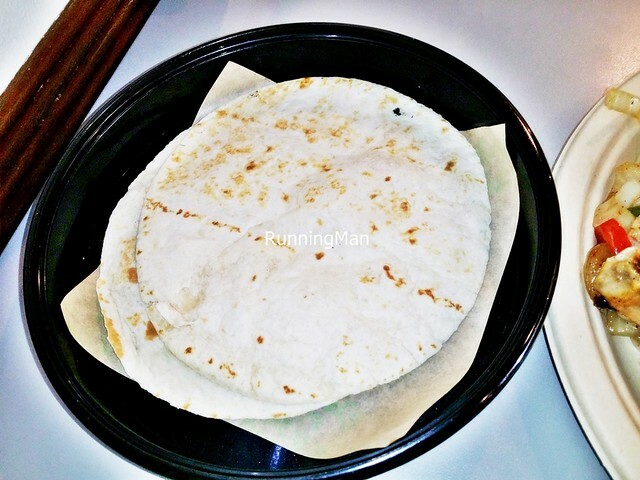 Love the slightly crunchy bits at the edges of the pan, and the moist center! Worth ordering! 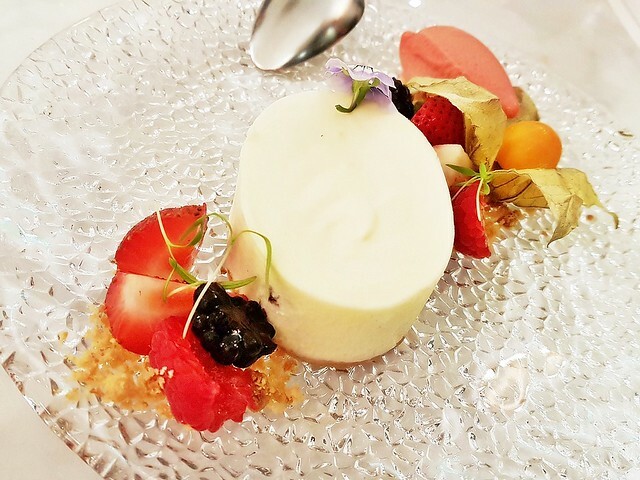 The Cheesecake (SGD $15) here features one of the smoothest, creamiest textures I've ever eaten in a cheesecake! With a fragrant light sweetness, the rich cream cheese mousse mixed with white chocolate sits on a buttery biscuit crumble base. 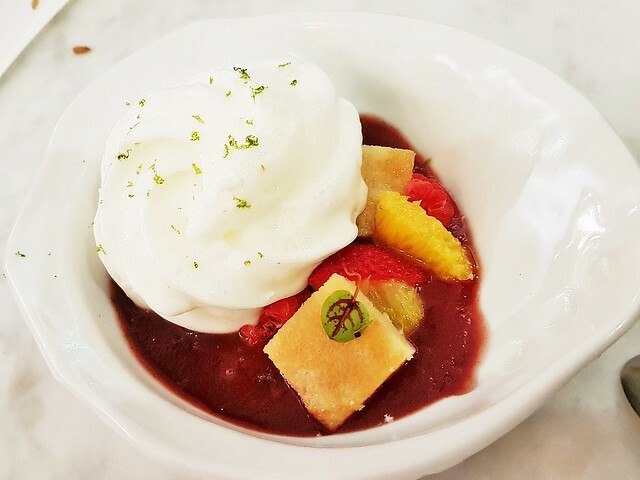 Served with fresh seasonal berries (strawberry, blueberry, raspberry) on the side. So addictive, yet not heavy. Highly recommended! Inspired by the cocktail of the same name, the Cosmopolitan (SGD $14) dessert here features cubes of soft, vodka soaked sponge cake, and fruity sweet Mandarin orange sorbet, served in a sharp sour tart raspberry coulis, topped with creamy and light Cointreau foam, enhanced with zesty lime juice. 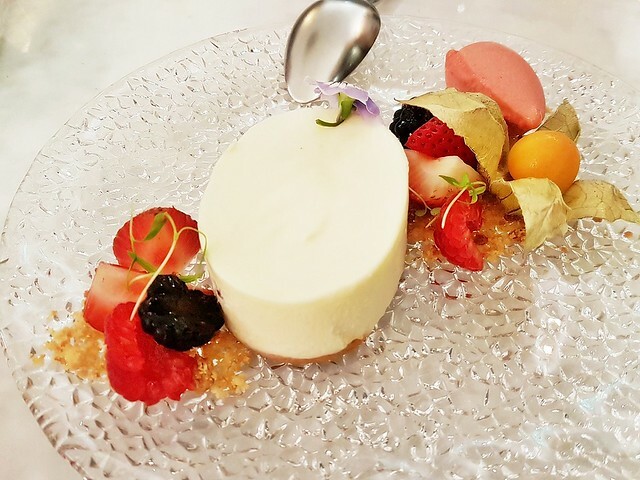 This modern deconstructed dessert is pleasing, although the individual flavours are intense, eating everything together makes it palatable.